I've been quiet round this blog for a while. This is due to starting a tank for my main army (and I've not even finished the interior yet). 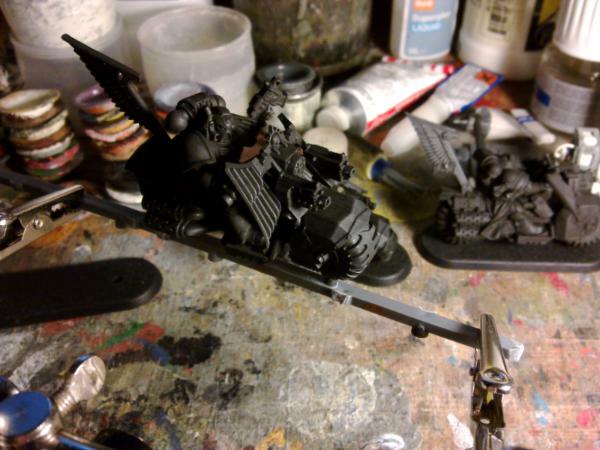 I can already tell that these will be difficult to paint due to them being built in one part, but I will persevere. There are still plenty of boxes and toilets left in stock, just send me a PM. And Company Master Balthasar is still available after my friend took a short holiday (He also has a limited selection of bitz available in his shop too). Not overly pleased with the result, looks a bit messy up close once it's dried as you can't tell what you're doing while it's wet. I may just resort to neat grey edge highlights with one dark grey layer over flat black... Keep it simple and effective (on the table). So this is the result of experiment number 3; thin line edge highlights. I'm never going to make it as a coachline painter... looking closely these aren't as neat as I would like. Maybe I should resort to good ol' dry-brushing. I know I can make that work with minimal edge highlights. I can't help you much here..I could never get black highlights to work right either. I think you need a darker shade (or 3) of grey-black mix from what I've read. Or maybe your black isn't black enough? I duno. Thank for the input, Dave. I've done black fine in the past with just dry-brushing, I'm just trying to push myself on these commission pieces and have probably just come up against my current skill-wall. There is two shades of grey in the highlights and I did try to get a dark grey line between the highlight and the black, but it just made the lines look too fat rather than blending in and in neatening the lines up it pretty much got covered over with black. I have to say, I would go with the tried and tested drybrushing, you have achieved great results with it. This thing of, got to go with new techniques, is great but we are forgetting the amazing results we used to get. I get the idea behind NMMMMNNNNNNMMMM! But what is wrong with mixing up some metallic in there. And what would be wrong with using Gloss? I know it's supposed to be photo friendly or something, blah, blah, blah. Anyways, Personally not a fan of the lining method. Looking forward to the rest of it though. Sorry for rant. No worries, Cam. I do generally agree with you. I like the metallic paints (the engine parts of both bikes have metallic on already) I have and I have a nice selection of gloss paints. But if you don't try new things, then you may be missing something better, and you always have the tried and tested method to fall back on. Yeah, as I said, it's difficult to photograph something so dark and keep it looking like it actually looks (they are slightly darker irl). And you can see the issue with the way the light catches the surfaces; I've been twisting these bikes this way and that to get the various surfaces at just the right angle to the light to see what I'm doing (although that's more an issue with my lighting set-up than the model). I'll be back when they've had some dry-brushing. K. I'll let 'im know. He runs the shop, I just paint things for him to sell. Shallow edges are a pain, they don't look bad just maybe a bit too many edges highlighted, less is better. so rather than try and do greys try using blue/greys at 3 (or so, depending how bored you are) shades, dark, mid and light depending on the surface, layered thicker the darker going thinner when lighter in shade. Yeah, I know about the white technique. Should have thought about that. I do have a nice blue/grey paint, I'll pull that out and use it for the (less is more) edge highlights that I'll add after the dry-brushing. I'm usually quite happy painting black, I was just trying out something new on these to make them stand out a bit. More practice needed. I now need to let these dry thoroughly before toning them down a little (yes they are a little too grey) with a black wash and then a very light dry-brush to finish (hopefully)... The third bike should catch them up by then. Now that is more like it. I know it has to be a bit blacker, and you have that in hand. But the toning across the edges and panels are excellent. You're right, we have to know. Watching this very carefully as I have some Ravenwing bikes to paint in the next couple of months, and wondering how I'm going to do the black. Thanks for doing all the experimenting for us lazy ones. Camkierhi wrote: Now that is more like it. I know it has to be a bit blacker, and you have that in hand. But the toning across the edges and panels are excellent. Reavsie wrote: You're right, we have to know. ...that is, a dilute wash of black over everything (it was, however perhaps a little too dilute). I have then added a light dry-brush of my blue/grey with a little light grey in, and just tried to catch the highest and most prominent edges. To be fair... they don't look terribly different in the picture (only one of these here has had the final highlight DBrush and I'll leave it to you to spot the difference and make my point). However, once I've added all the other colours (which involves a fair amount of white and the bright red guns) the black-that-isn't-quite-black here should look black... That's the theory anyway. If it doesn't I can always darken bits later when I know where it's needed. Blue/grey plus light grey. 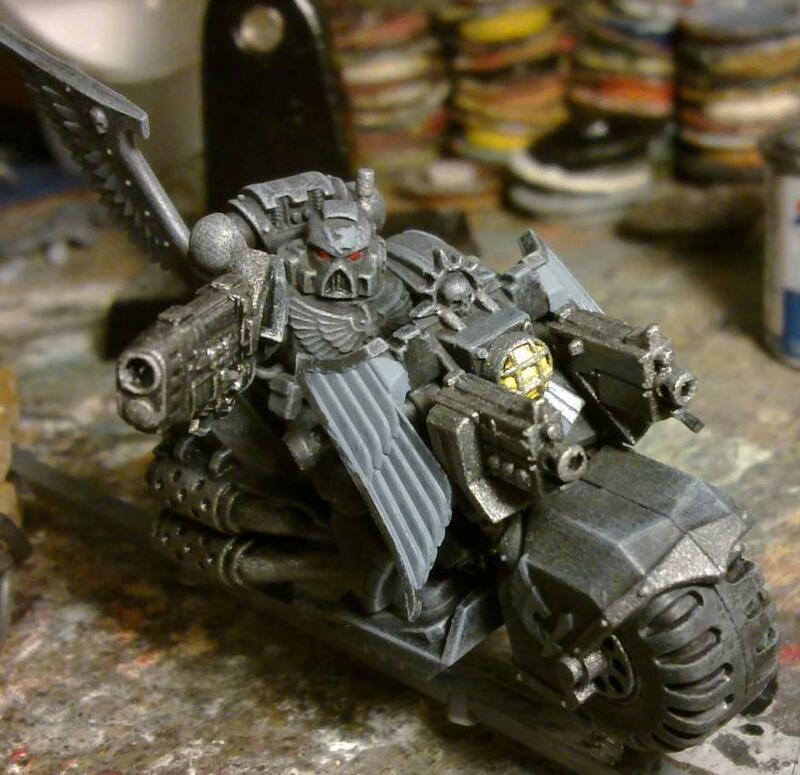 You will also notice I didn't do the black wash step, as I was more restrained with the brushing on this bike and I think the extra lightness and blue-ness will make this bike stand out a little (as he is the sergeant). It's in my nature to experiment anyway, and I'm happy to share. I've base-coated the grey metals (gun metal) and the white areas (grey/blue) and done the lights (as I wanted to do the metal grill over them). Looking great. Sorry can't really add anything to that. 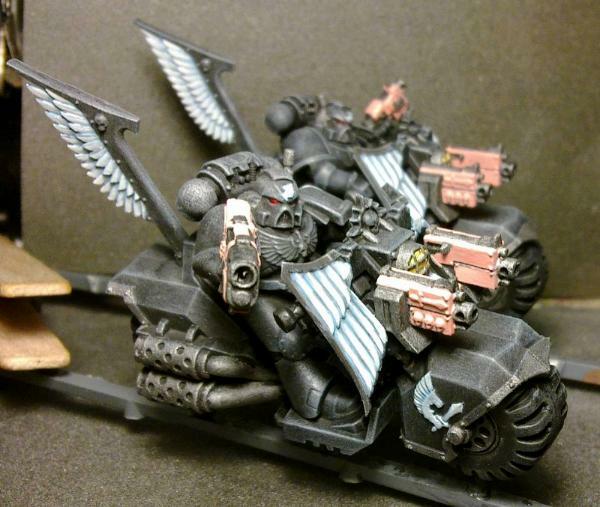 Here's the second Bike after the light has been finished, the eyes done and the metals washed with black. For the bases, I was thinking that I might do them on tarmac for a change... Good, Bad, Indifferent? The other colors are really bringing it out now. MOAR other colors! Hmm painting black, I've found the trick is to blend in your darkest grey with your black and then work up. I also find that highlighting in straight lines along the edges doesnt always work sometimes, I seem to be doing this more now, I paint in lots of small lines going down from the lightest part while building up my colours giving an uneven approach it adds a feeling of shadow. dsteingass wrote: The other colors are really bringing it out now. MOAR other colors! Glad it's working. There will be more soon. GiraffeX wrote: Hmm painting black, I've found the trick is to blend in your darkest grey with your black and then work up. I also find that highlighting in straight lines along the edges doesnt always work sometimes, I seem to be doing this more now, I paint in lots of small lines going down from the lightest part while building up my colours giving an uneven approach it adds a feeling of shadow. Are you talking parallel (as I tried earlier) or perpendicular lines (as often done on Tyranid carapaces)? I did also try the blending from black to grey. I think the way I tried I spread the blend over too much of each surface and should have done it nearer the edges (leaving more plain black space). Not painted a bike before though so it may not work. I'll keep that in mind for something in the future. Possibly with bikes or other "fast" vehicles it may be good to do the lines in the direction from front to back. Might give the impression of speed. Me neither, these are my first. They would be so much easier to paint in pieces. 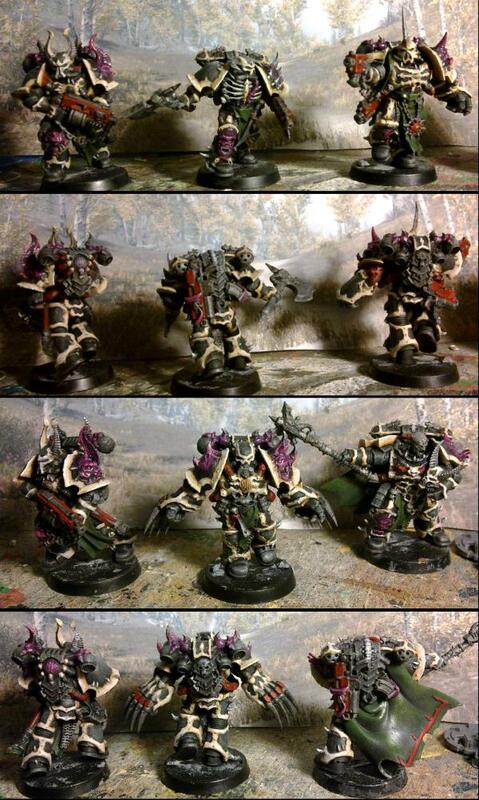 Sadly, these being Dark Vengeance models, they are pretty much one piece. 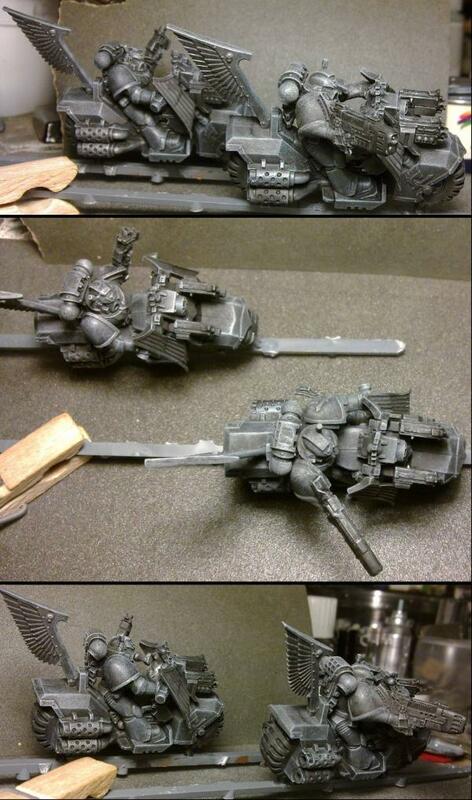 I even thought about chopping them up into more convenient pieces (and probably would have if they were for my army). There's a surprising amount of small surfaces on these too, which is the problem with the edge highlight painting. I agree some more colour touches would be good to give better depth to the grey-blacks, will be waiting for those to come up. Maybe a fuller black, rubber like, could be used on the tires? There, it could be then lightly weathered or soiled in earth or dust tones, instead of requiring shading over black... (and by lightly I also mean keeping in mind it will be put up for sale, and should keep basing options open as well). You've pretty much read my mind there. This is what I've been doing today. The white bits. On top of the grey/blue I showed earlier, I have layered a "middle" blue and blended that into a light grey mixed with the blue. Then layered the pure light grey over that and finally a layer of white over that. Not terribly pretty up close, but should look nice on a table. Still to do are the gold and brass bits, highlights on all the metals, the tires, and a few touch-ups here and there. Also, how's this for tarmac? Very nice paintjobs throughout and the tarmac is brilliant, how do you achieve that, GW gravel flock rolled flat? Great technique. Thanks, Gogsnik. Welcome to my second (internet) home. 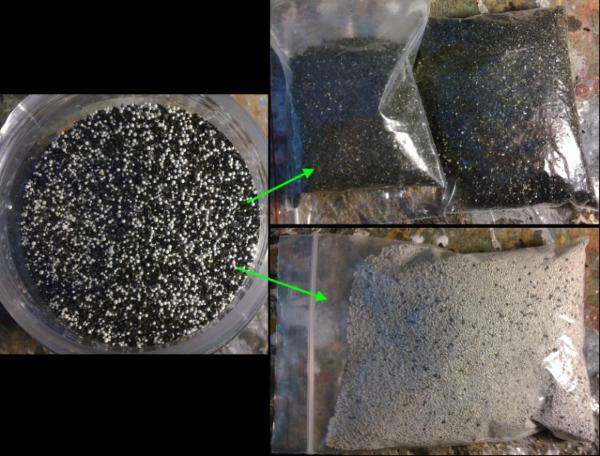 The tarmac is actually made with the same material that I have made the other bases with in this thread; that is the black gravel-like stuff (I assume activated carbon) from a water filter. Instead of just sprinkling it onto PVA, as I did for the other bases, I added much more and pressed it into the glue to get as flat a surface as possible with minimal gaps. Then when it was dry I gave it a light sanding to flatten out the pointy bits and give it that compressed, tarmac look. Dude! The tarmac/blacktop is fantastic! That one is a tip for the ages! I need some water filters now! Cool, thanks guys. Glad you agree. Water filter contents may differ, but what I acquired contained a mixture of the black gravel (activated carbon) and white beads (molecular sieves?). These needed separating, which I achieved with a little patience and the help of a brush and an inclined plane (Brush the black bits up and let the spherical white bits roll down). It's not entirely perfect, but does a lot of the hard work for you. Use the black for gravel (or tarmac as it happens) and the white for round-head rivets. I actually like the "robes" looking like leather, not sure if you are finished with them or not, but right now they actually look really good. Over all it's looking brilliant so far.Amazing how the colour takes the black down nicely. Ah no, the robes have just had the same base dark brown that the pouches, holsters, seats and his head got while I had it mixed up a ready. I was planning on blending the cloak up to the usual Dark Angel off white, with the brown in the creases like on the company master. Thanks. I'm glad it appears to be working. There are a few patches I've noticed that need a little darkening and I'll do that when I touch up the black areas that have received some painting slips. Thanks Gogsnik. You even get a variety of sizes of round rivets. I've been a little quiet here, but I have been busy. The list of things to do on these bikes is now very short, so they will be finished soon (and then I'll be back on my tank ). Sorry to disappoint you, Cam, but I have finished off the cloak in typical DA colours. Here's a teaser picture to tie you all over until I finish all three bikes. and yes, I still need to do his skin. Not started on that yet. Hey mate.... those grey metals look great! slightly rough but actually quite a solid and robust look to them! cool! 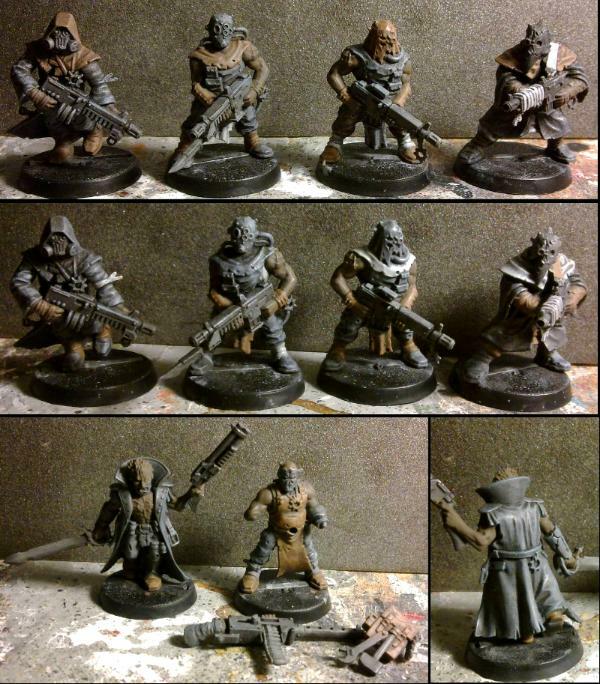 They're just a gun metal base, wash of black and dry-brush silver. I think it's just a matter of not making it entirely uniform in your application. 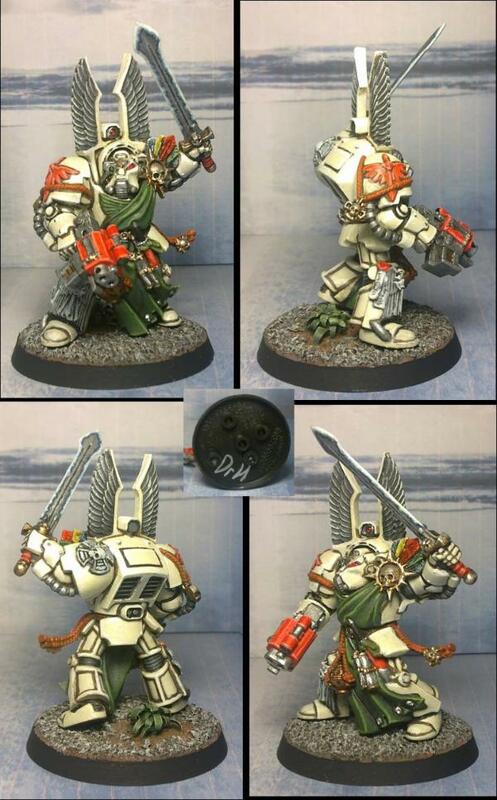 Looking great, and although I am slightly disappointed, I get it, you are selling a perfect codex model. And I think it's not far off perfect BTW. Do not worry though, as these are the last of the DA models in the box. That means that I'll be moving on to the chaos models soon and, as far as I can tell, they have far more scope for varying colour schemes. Ah chaos. 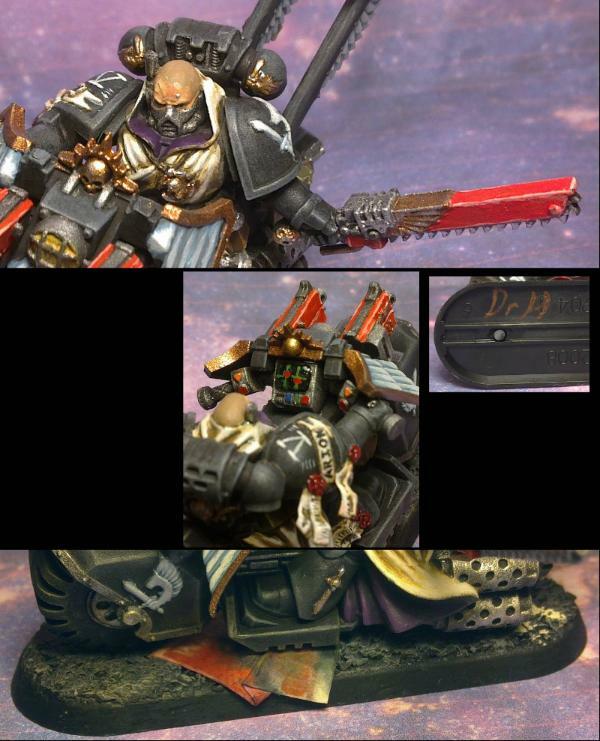 I would suggest that Black and gold everyone seems to be doing, at least thats what the old codex I have kicking about is full of. Was Red and gold years ago. I know you will make it all lok brilliant. Ah chaos. 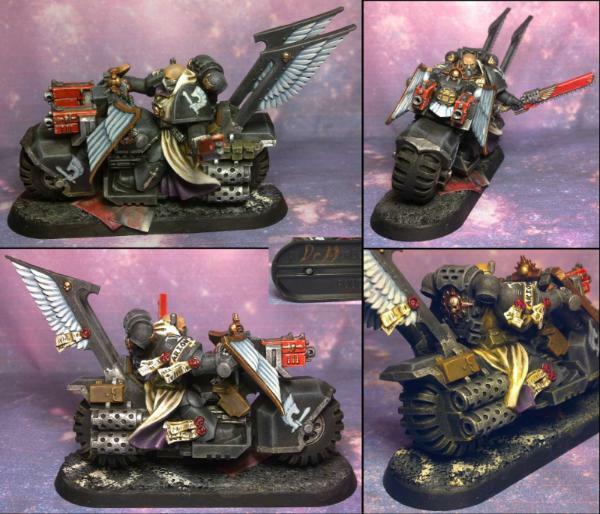 I would suggest that Black and gold everyone seems to be doing, at least thats what the old codex I have kicking about is full of. Was Red and gold years ago. Yeah, I've seen both those schemes. 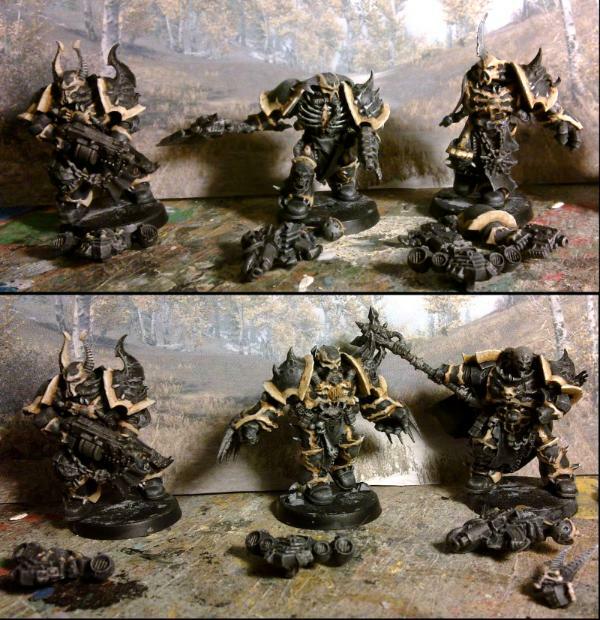 Black and Gold appears to be the poster-boys of the current chaos marines codex. 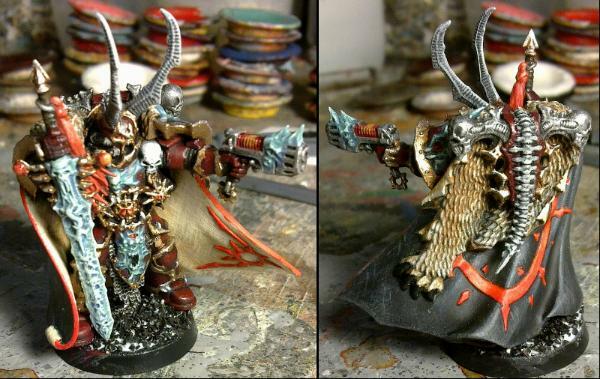 But it's possible to get away with variations on the theme in a way that isn't really accepted for the non-chaos marines (or so it seems from the internet). Also the different units don't have to match so I can do a few different schemes. 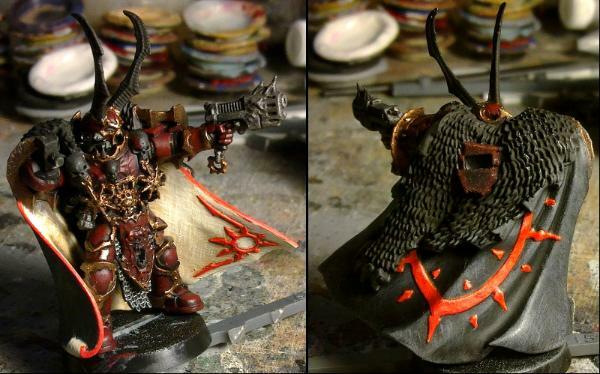 The Chaos Lord. He is named, so may get a more "standard" scheme. Some Chosen. Who look suitable for a more "interesting" paint scheme. A whole bunch (20?) cultists. Who come complete with plenty of leather and I'm definitely thinking of a Mad Max look, for some of them at least. And the [sarcasm]Much Loved[/sarcasm] Hellbrute. Which I may as well go all out to make it look as good as possible with a unique paint-job, or nobody will be interested. I know you will make it all lok brilliant. I did do it in several sittings though, while letting paint dry and watching tv. Thanks, hope you like them. Those are looking really good! I do like how the black finally ended up, the contrast with the other colours just did the trick for that. Quite brilliant. They definately look the part. Beautiful work. Littletower wrote: Those are looking really good! I did darken the middle of the black areas a little with a dry-brush of black (using a very short bristle brush that lost it's point ages ago), so it's not all just the addition of the other colours. Camkierhi wrote: Quite brilliant. They definately look the part. Beautiful work. Pink primer for the guns, then added the red, LOL! so many things military used to get pink primer before the camo was applied. The Allies of WW-II sure had a flair for military fashion, as primer is to a plane/tank/sub what underwear is to their clothing. In this case, a pink undercoat gives a nice vibrant red. As opposed to a brown undercoat, that would give a darker, more earthy, red. It's one of the rare occasions that it actually makes a difference with my paints... most of them don't care what's underneath. 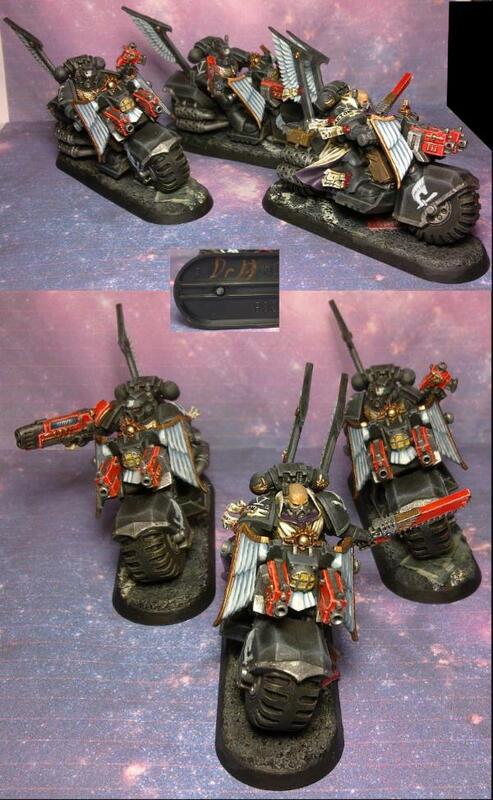 The bikers are up on ebay. Also, the Company Master is still available. And don't forget that My boxes and toilets are available too. Also also, the final pictures of all my models are very zoom-able (if you haven't tried yet) and also vote-able (if you feel inclined). I'm in the early stages of researching the Chaos models and will be back soon. I really like your black on your bikes. Its smooth, and not flat. Nicely done Dr H. I will be using your style for black in the future. cormadepanda wrote: I really like your black on your bikes. Its smooth, and not flat. Nicely done Dr H. I will be using your style for black in the future. 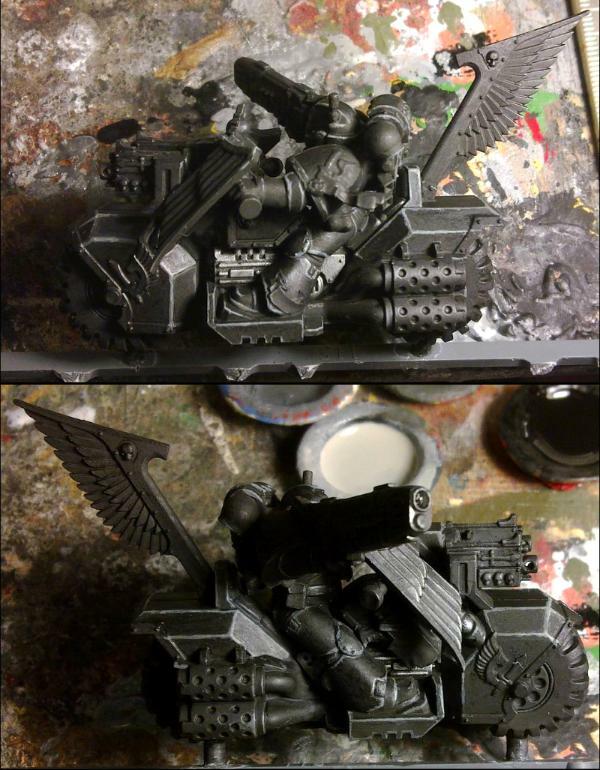 Yeah, sadly these click-together models don't really lend themselves to conversions. However, my modelling seems to be somewhere where I can make more money (at least until my painting gets better and/or faster). So there may be more "unique" models on sale at a later date... Watch this space. And I will get round to the sinks and baths soon...ish. As I've mentioned, and if you are familiar with the DV box, you will know that the Chaos army is next. What do you think of a quartered black and white armour with gold and/or silver trim? They are not even glued together yet (and I'm still working on my tank...), so there is plenty of time to change and I'd like to hear what people think (especially those familiar with Chaos Marines). 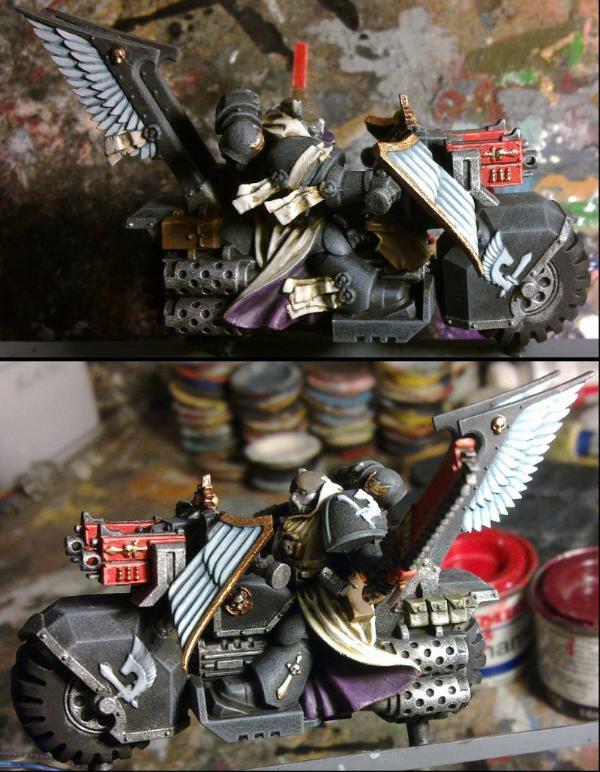 I was hoping for something like fallen Dark Anels, the black you've done on the ravenwing has been awesome, so you could do the pre heresy Dark Angel Livery on them. Yeah, part of the reason for choosing black and white is that many people seem to have problems painting them and therefore that should up the desirability of these. 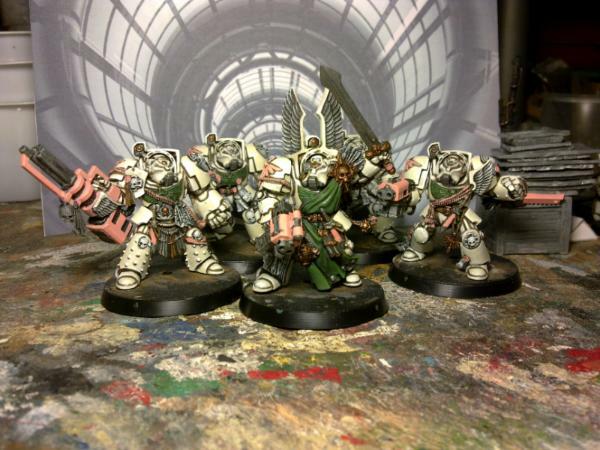 However, if I do them solid black (had to look up the pre-heresy scheme) then what colour do I do the bling? 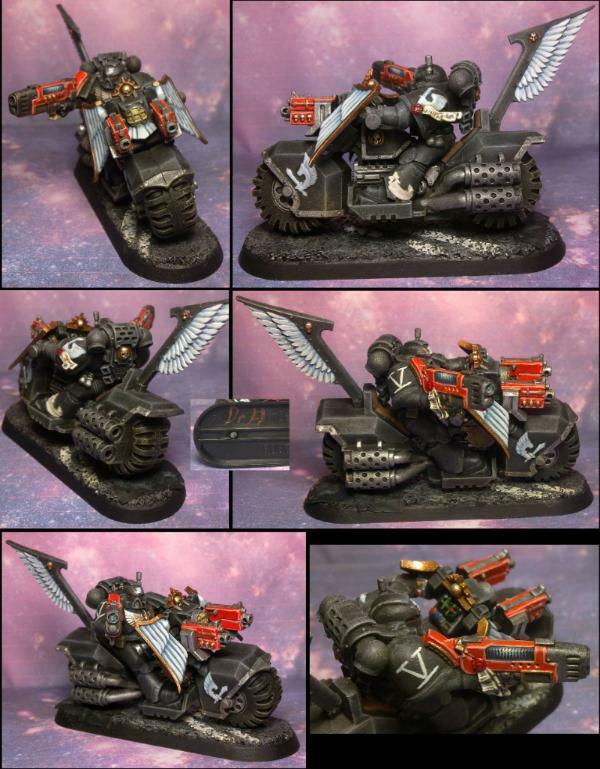 If it's done in gold, then that's black legion (maybe?). I wanted something different and I quite like the one quartered marine I painted a while ago (and a couple of half/half models), combine that with the black and white thinking above AND that you don't see white on Chaos models (this is the part that I'm not sure if people will accept), you have a unique selling point. 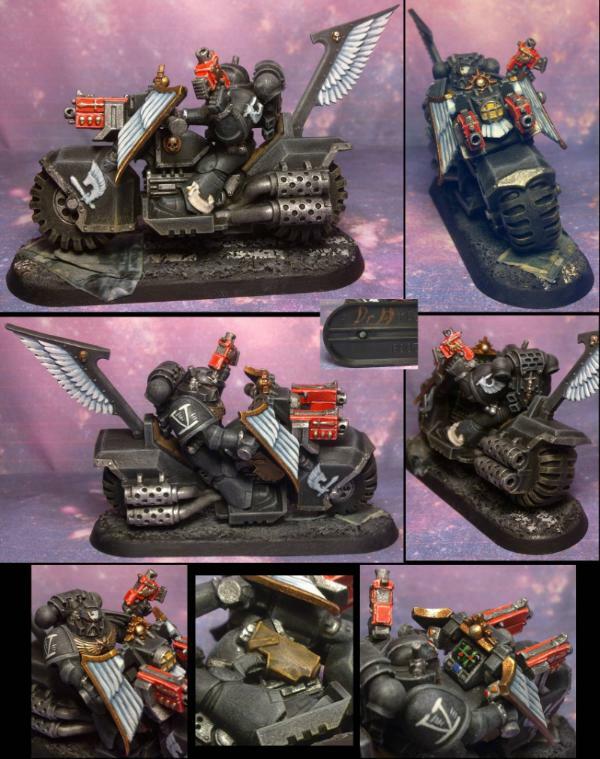 Well if you look at blacklibrary.com they have the Horus Hersey covers for the Dark Angels. Most show silver trim with white shoulder pads, but they have some gold as well. 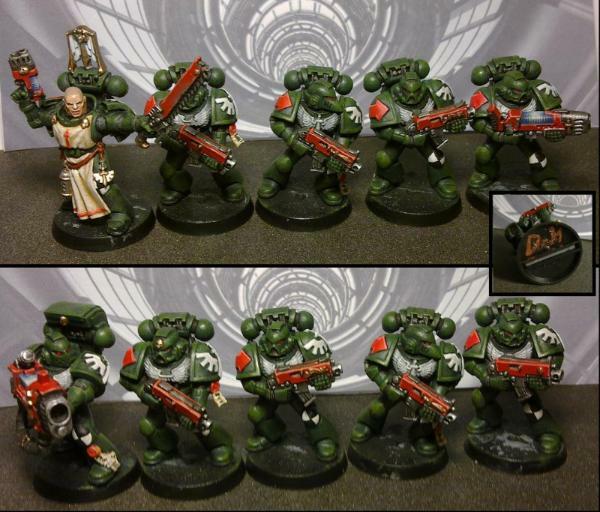 You could also do red which I've seen a lot for the Dark Angels symbols, or even green as they started the color transition once Caliban had been located and their primarch found. 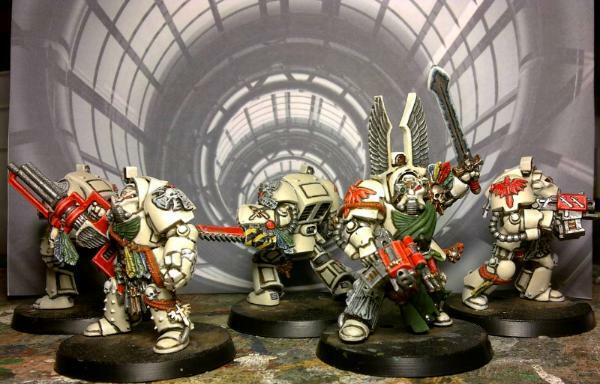 Black and white quartered reminds me of The Sons of Malice chaos marines. If you google their image you'll find them. They worship the fifth chaos god Malaal I believe who has been written out of the current rules. Ahh, been done. Bugger. Thanks Theo. It's a thought. I'm open to more ideas if you have them. Maybe some kind of corruption of the DA scheme... but how do you corrupt dark green??? How about black armour (instead of the "official" red), with bone trim (instead of the gold), and dark green cloth...? 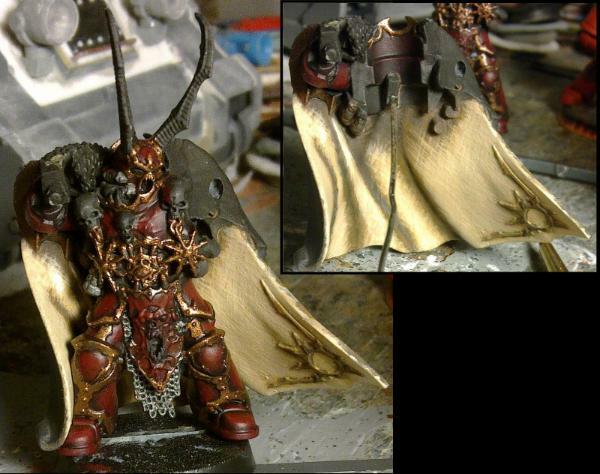 Then pick out the various (and many) extra bits in metal (gold and/or silver) and the odd red touch (like the evil eyes etc...). 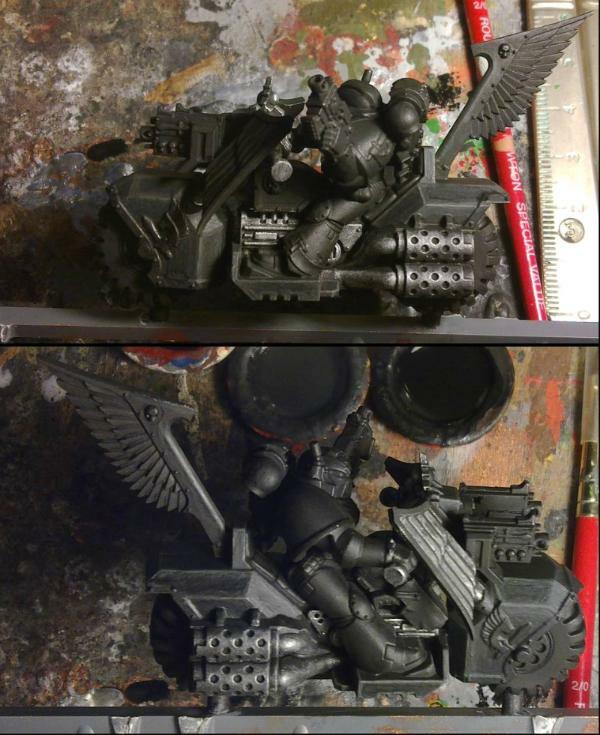 That could all work as a corruption of Dark Angels. But is that a unique scheme in the armies of chaos? 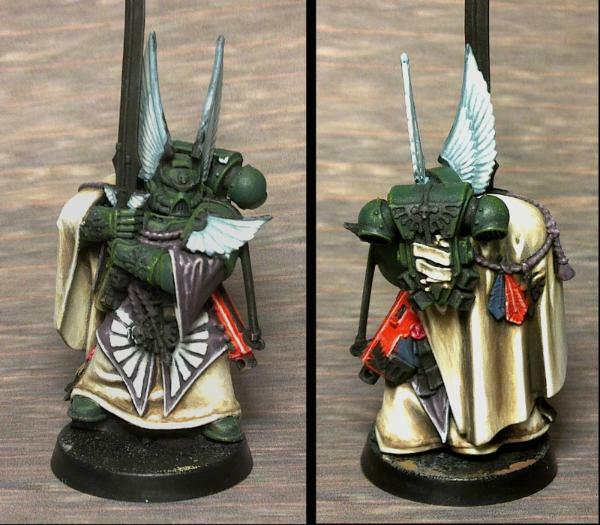 I don't recall any black and bone colored armies, so I think your good there, though swapping around the red and green I think would be better as the original Dark Angels had the red markings, forget what color lenses, but I've seen some sweet green oath seals before. 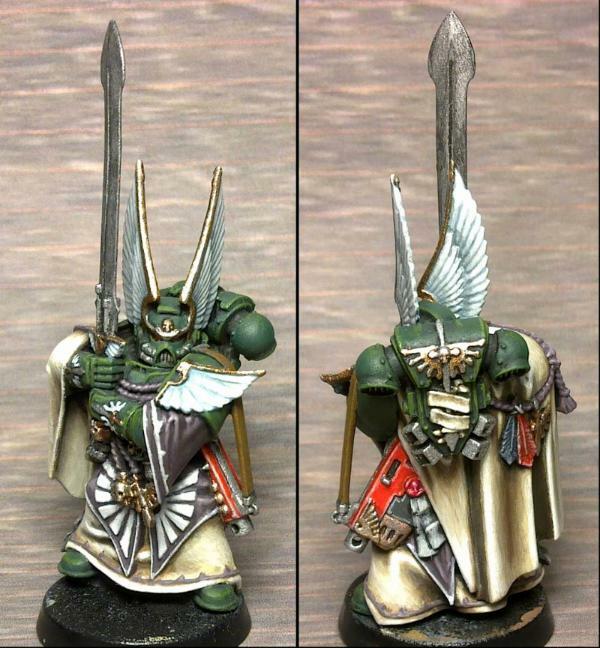 though swapping around the red and green I think would be better as the original Dark Angels had the red markings, forget what color lenses, but I've seen some sweet green oath seals before. The thinking behind the green cloth and red spots was that the whole model will be mostly dark and then the little patched of red will jump out. But that doesn't need to be set in stone yet. We can see how dark they look with the black and bone and decide then. So, progress on the Chosen. They have been fairly boring looking up to this stage which is why I haven't shown the earlier stages. This is after a black base coat, a heavy dry-brush of dark grey, followed by a light dry-brush of light grey (trying to catch only the upper sides, edges and faces). Then the trim was based in brown then blended/layered from a medium brown to bone and highlighted with white. Again, I think it will look better then it does now once I've added the other colours. There's much more to do on them and some tidy-up is required already in places. 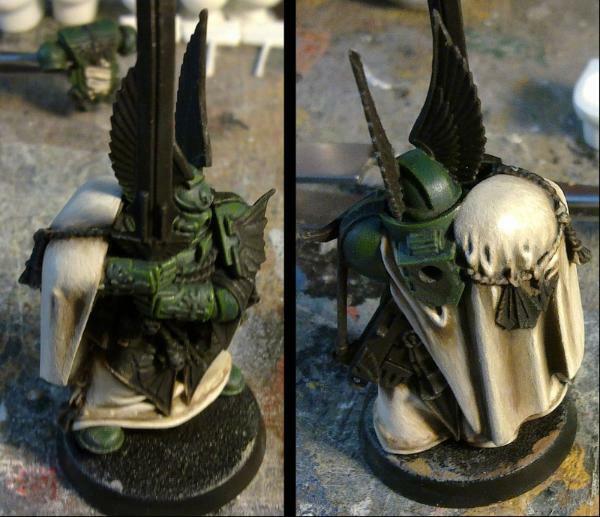 So, to go with this scheme, do we think the cloaks etc... should be DA green with small touches of red, OR... Should they be red with small touches of green? I've painted the grey bits, which includes the bone shaped bits, a few horns and all the little teeth-like bits that are randomly spread over the models (two layers of grey). I've also base coated most of the possible metals bits with gunmetal and washed all of that with black and I also added the black wash to some of the black armour plates to enhance shadows and clean up edges. I used a damp brush to clean up the trim where the wash went over, although in places this left a nice shadow effect that I decided to leave. Looking at them like this, I'm leaning towards the dark green cloaks as they aren't all that dark and to make them red would only lighten them further. I'm still open to opinions at the moment. 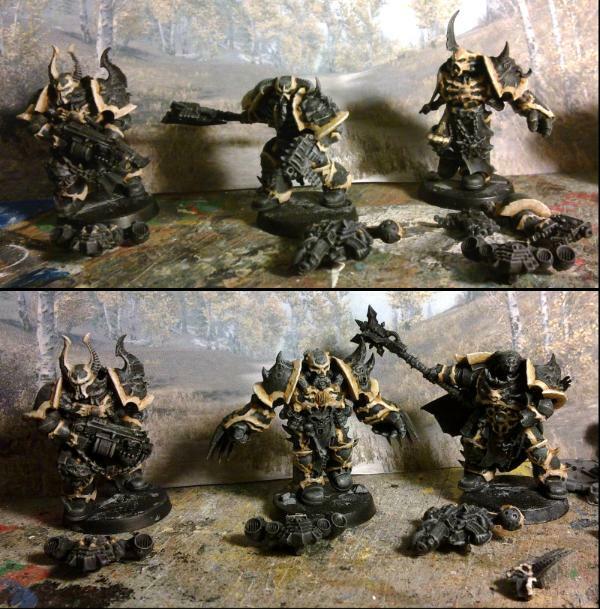 I also lightened the "bone" bits and smoothed out the blending on them in places. If you want to go purple-flesh have you thought about working up to flesh from black then using a purple wash or glaze to tint the blend? Thanks Monkey. Yeah, it's fairly new. I started this one to keep my army thread for just the army. Yeah, I did think that. I did even try to save the flesh disaster with a wash of the purple, but that didn't work well either. A glaze probably would work, but I don't have any... well, any that are purple (green and red clearcote paints at least). I just saw it as nature telling me that they were not meant to have flesh paint on them... Maybe I'll do some highlights with the flesh though... Those bits aren't quite finished yet, but I had to let the paint dry before doing any more. For today's update we have the chosen fully assembled as all the hard to reach places have had all the paint they're going to get. This also means that the red and green are now set in place (sorry Theo, I went for green cloaks and red spots). As the purple/pink ended up slightly shiny (due to using a gloss red in the mixtures), I'm not going to give them any more highlights and will leave the shiny effect to do this job and make all the tentacles look a little moist. The green has also ended up a little glossy in places, but this will be fixed with a matt varnish. In contrast to the DA earlier, I've made the red duller and not as vibrant by using a dark red/brown undercoat (as opposed to the pink from before). I've still got to do some highlights on these bits, so they are not finished yet. All the metals are still to do or finish and a few other bits as well. I think I'm going to call the Chosen done. All the eyes ended up orange as I've been watching the LotR commentaries so big, orange, evil eyes had to be done. There is the occasional chip / dirty patch on the armour which I chose not to touch up as, being chaos, they should be a little knocked about. The two identical models in the box have had a few differences added in the painting to make them a little less identical. These are meant to be an exercise in painting to a reasonable level, quickly... although they took slightly longer than the bikes (at 32.5 hours), there are twice the number of models, I had the issue with the possessed skin/armour and I've placed these on the bronze level (so I could have spent much longer on the blending etc...). I think they are a nice, unique, table-top level squad and I'm pleased at how they have turned out even if I could have taken twice as long to make them really nice, but that was not the aim for these. I hope you like them and I'll post the link once they are up on ebay. Great job Doc Good quality table-top is what you've acheived alright. The purple fleshy parts turned out ok in the end. Very nicely done Dr. H, your colors worked out great . Like the eyes too. Looking brilliant. And I definately love the colour scheme. Theophony wrote: Very nicely done Dr. H, your colors worked out great . Like the eyes too. Thanks Theo, glad you like. The eyes were just a gloss orange followed by gloss yellow towards the middle, while wet. Then a bit more yellow in the middle to make it more vibrant and finally a black line/dot/splodge depending on how well I managed it. Had to re-do the ones on the axe as I totally ed them up first time round. Camkierhi wrote: Looking brilliant. And I definately love the colour scheme. Can highly recommend the boxes to people, tried them and they are brilliant., going to be working on the toilet soon. Thanks again, Cam. Glad they stand up to close scrutiny. These pictures show all three currently available sizes of box (small, medium and large). You can do this with the boxes as each side is separate and thin enough the cut with a hobby knife. The new boxes in these pictures were painted with a grey undercoat, followed by a white dry-brush and then coloured with an acrylic ink (that I bought recently and thought I'd try out. 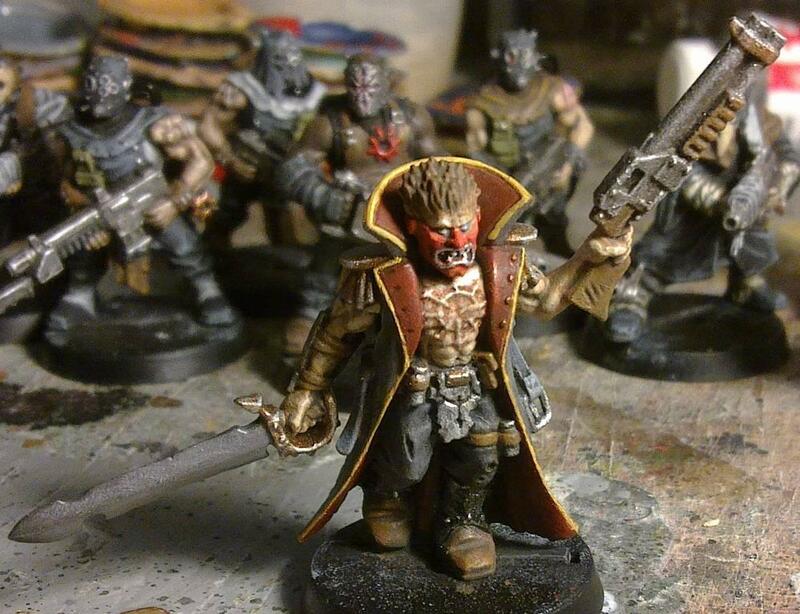 Burnt Umber for those taking notes) and then patches of dark brown/black wash were added to darken areas as needed. That's really good . How did you make those worms? Those are made with a sausage of milliput (GS would also work) of the desired thickness, a flat surface (slightly wet to avoid the putty sticking) and a comb. Pull the comb over the sausage as straight as possible, letting it roll on the surface, then bend to whatever shape you like. I tend to do this with any left over putty I have when doing other things and then leave them to one side until I need a cable/worm/tentacle and then select one (or many) to fit. Alternatively, you can buy a cable/tentacle maker which produce more repeatable results... for a price. I've also heard it's useful to put a length of wire down the centre of the putty sausage to allow positioning without the effect of gravity getting in the way. 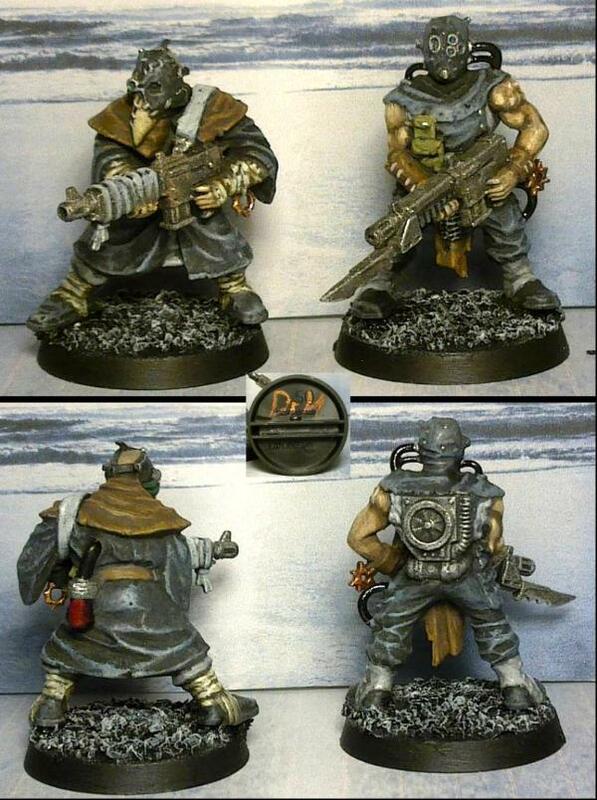 The Chosen are now up on ebay. 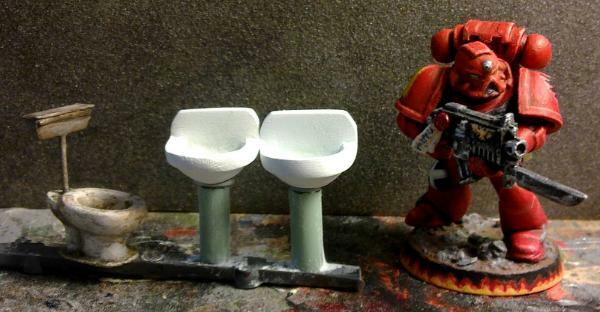 I've also opened a post in the Dakka swap shop area with more details of the toilets and boxes. 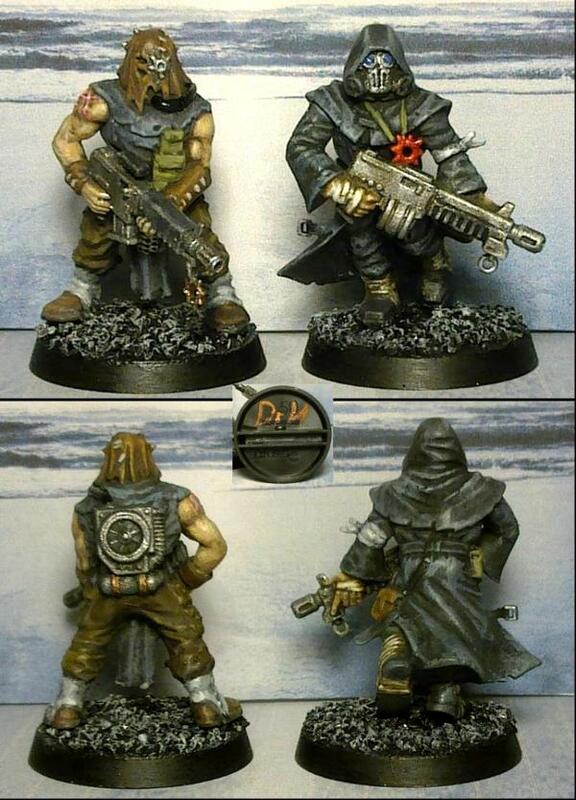 So, next up are one of the Cultist squads. I've decided to limit the colours with these and try and get a Mad Max look to them, with black and brown leather, brown, white and beige cloth and only use other colours for small touches. As many of them are repeat casts, I'm trying to give them all individuality in their colour layout. Skin tones will vary between them, but undecided on by how much except that the heavy weapon chap will be the token black guy... or at least the darkest of the bunch. This is with just the base coats on and the start of building up the depth in some of the colours. 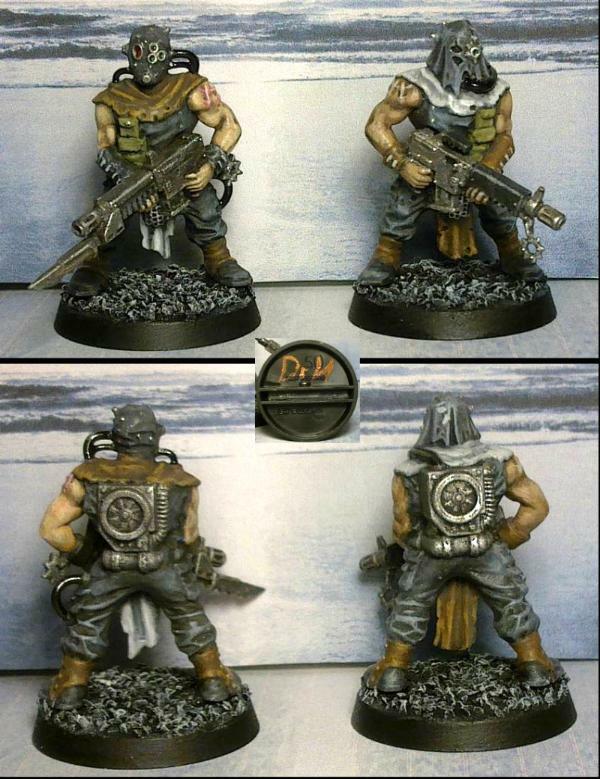 Looking good so far, I'm starting on the CC cultists and was thinking of going for a similar scheme (damn you!). 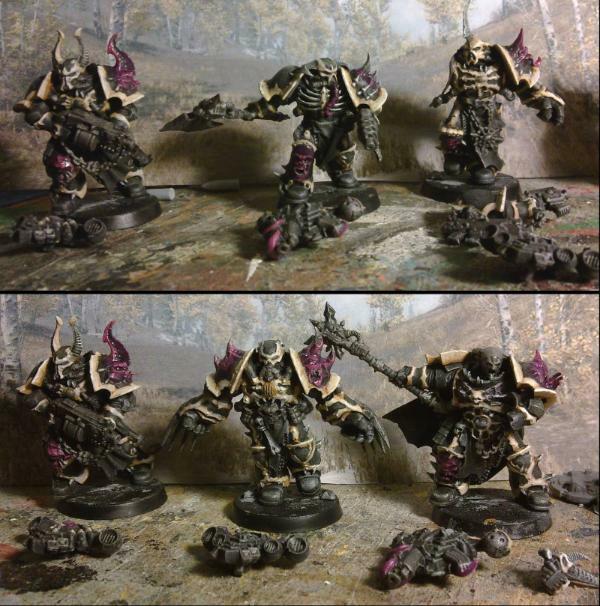 OneManNoodles wrote: Looking good so far, I'm starting on the CC cultists and was thinking of going for a similar scheme (damn you!). Thanks OMN. Ha ha, sorry. Do not be discouraged though, these cultists do scream out for this kind of scheme. That said, I will probably go very different with the other squad. So, I've done a bit more work on these. A bit more highlighting on the black areas and mostly done the skin. I've tried to get a variation in the skin tones, some a quite light and some are (slightly) darker. It's actually quite difficult to depart from the Caucasian tone really. I've done a little research, but it's difficult to pick out the paint layer colours required for non-Caucasian. Need to do a bit more research and practice. 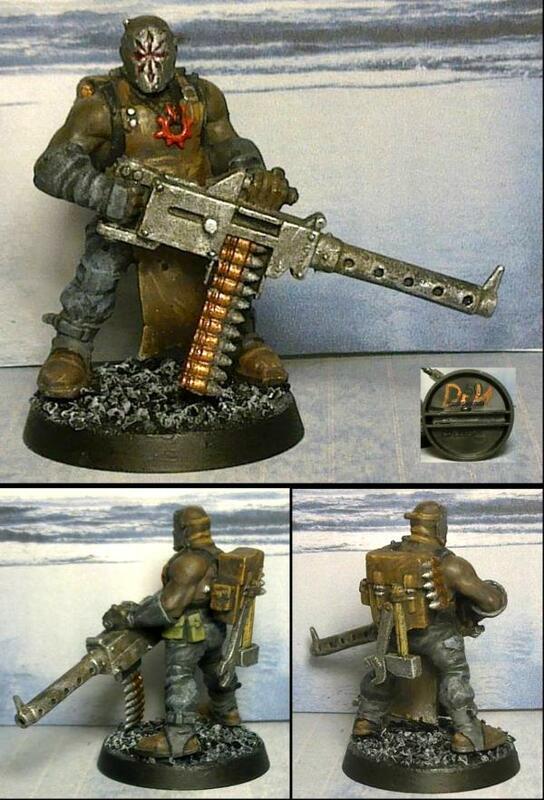 But I am happy with the tone on the heavy weapon chap. The skin may get a bit more work once I've added more of the other colours and can see how they contrast (the heavy weapon in particular). Very Nice skin tones with really nice contrast. Thanks Noodles, I'm glad you think so. They are quite detailed models I have noticed. Anyway, it's also to do with me painting one colour, thinking I'm all done and moving on to the next and then finding something that I meant to paint with the previous paint... So, some of these have one colour all done from shadows to highlights and then another colour that is only part done. 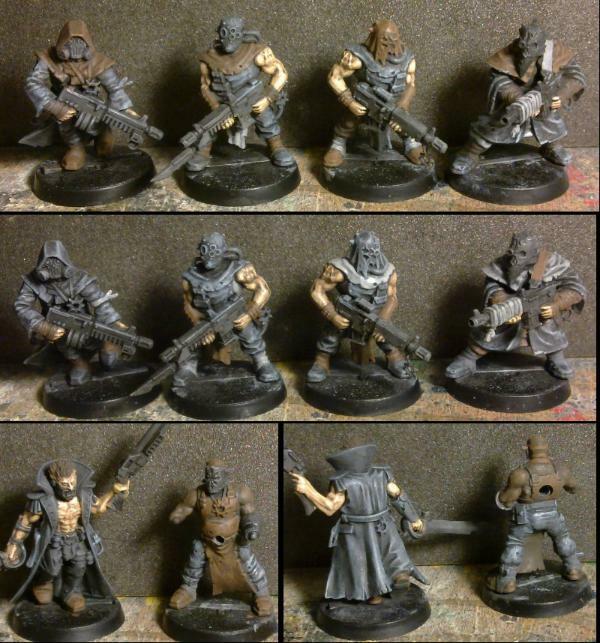 The cultists are pretty much finished (still got the bases to do), if you spot any issues speak now, thanks. You may also have noticed that the leader of this group has been missing from the last couple of updates. This is because he has lagged behind on the painting front and today's job is to get him done...ish... then I'll base them all and they will be up for sale (hopefully by the weekend). Look good to me, nothing glaringly obvious. Skin tones look brilliant. Thanks Cam, good to know. Glad you think so, tricky (as you know) to get skin looking right. That and bases tomorrow and then I'll take some proper pictures. Nothing to add, looking really good, in their own, odd chaosy way. Nicely achieved skin tones, with contrast and variety. I love that piping along the leader's coat! I wish I had that kind of brush control! Littletower wrote: Nothing to add, looking really good, in their own, odd chaosy way. Thanks LT. Glad everyone is liking the skin, I've not done a lot in the past and not had any comments on whether it was good or not (ignoring the Ork Driver for now). dsteingass wrote: I love that piping along the leader's coat! I wish I had that kind of brush control! Thanks Dave, resting both hands on a solid object and against each other and take your time to do it little by little (took about half hour to do a layer of orange then the yellow). The piping is moulded on to this model, which makes it a little easier. Still required a fair bit of tidying along the outside edge as I went though. 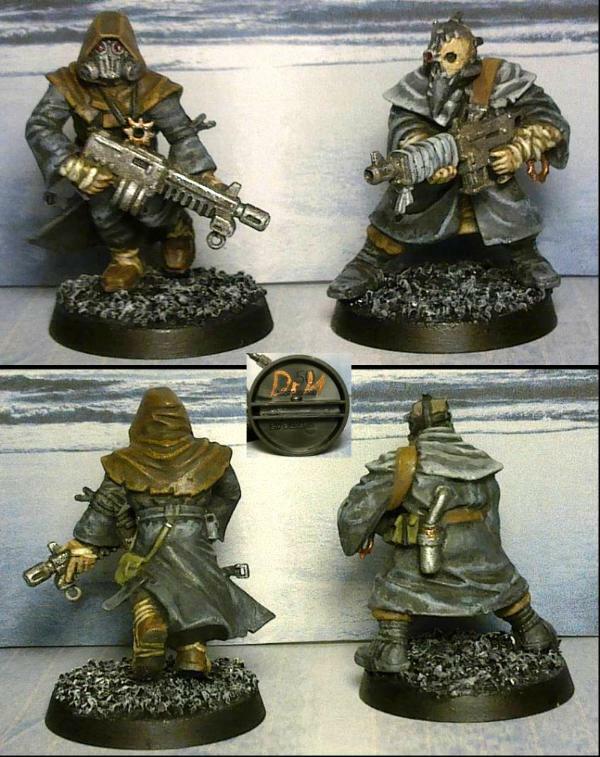 The Cultists of Sect Tetchvar are done. Thoughts, comments, votes are all welcome. Excellent job, leader looks brilliant. Glad you did something with his hair. Here's hoping for a quick sale. I prefer their muted color palette. Can I offer one slight suggestion though? the grey highlights look a bit too pasty/drybrushed. May I suggest a grey glaze over it all to soften it up a bit? In contrast, the arms already have that effect with the dirt/grime. Camkierhi wrote: Excellent job, leader looks brilliant. Glad you did something with his hair. Here's hoping for a quick sale. I was originally planning on giving him blond hair and then thought I'd try to make it look like sun-bleached brown hair (hence the brown first coat), but I ended up going a little too far with the bleaching and he wound up blond anyway... Instead of going down the path of back-and-forth with the hair, I called it done. Moltar wrote: Nice cultists, Doc! Yeah, another experiment. I don't usually limit myself with colour but thought I'd see if I could give them individuality (on identical models) within the colour palette limits. I think that worked well and it leads to a uniform look to the squad (as mutually exclusive that may seem as first). I'll post up the link once they are on ebay. Hey Dave. Thanks. Yeah, I was tempted to give his gun hazard stripes but, limited palette. Yeah, I know what you mean. I did go far too far with them on the first go and toned them down then re-highlighted again... and in places gone a bit too far again. It looks worse in the blown up pictures then IRL. These are meant as only tabletop level, but I'll see how they get on and re-visit them if they're not snapped up. 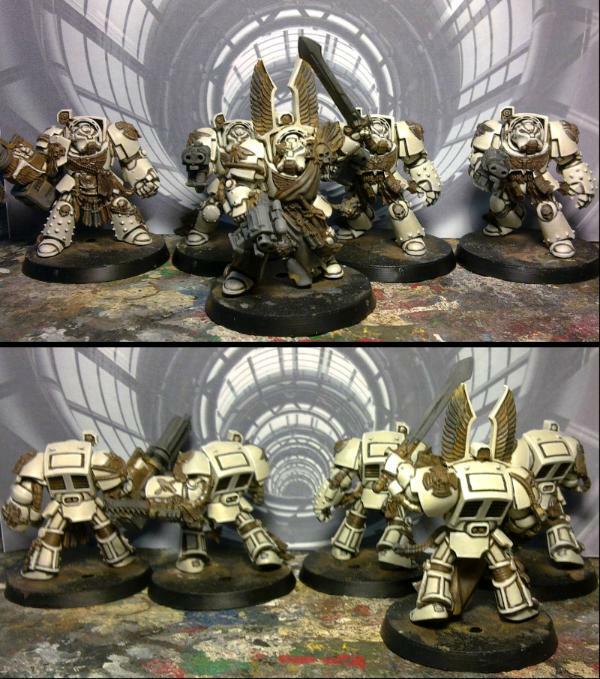 If they were for my own army, or silver / gold level, then I would have gone further to make these better. Also, I set a personal best time of just under 2 hours each on these. So that's also good news. and to you again. It's a rocky beach of the kind that makes everyone walk funny. A lovely bunch of murderers and cut-throats! Thanks Lamby. Glad you think so. Next up is Kranon the Relentless. Due to the unique way he is assembled (i.e. 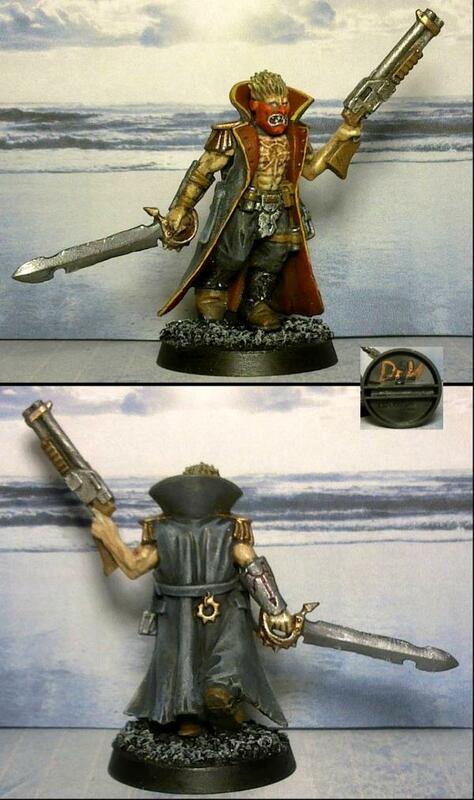 his arms attach the the cloak piece, but only after that is attached to the body... ) he is best painted in pieces. There's so much detail crammed on this model it's really difficult to tell what you are actually painting, even with a magnifying glass. I expect many occasions in the coming days of " that's supposed to be this colour, not that colour". 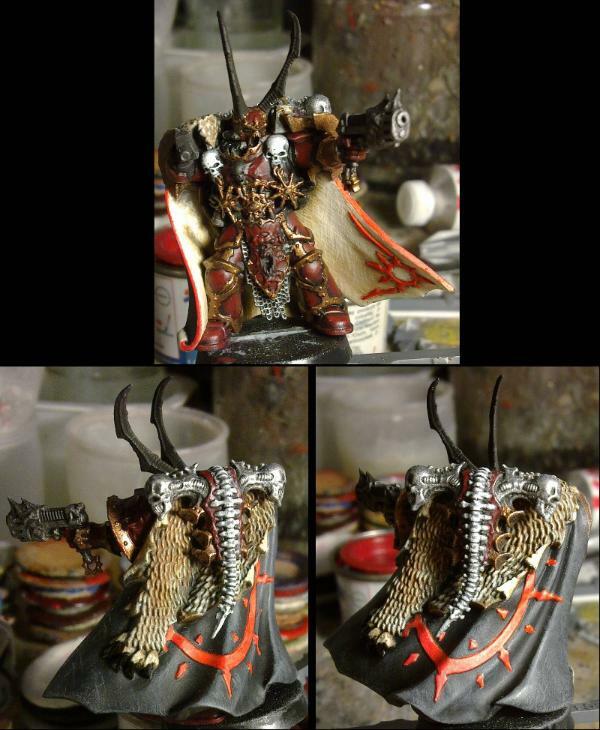 I have mostly settled on a scheme and it is mostly based on the official Crimson Slaughter scheme of red and gold. A few changes though; The red will be deeper and darker (the main paint I'm using is called Crimson... seemed to make sense). To contrast with this, the gold trim will be quite light. The cloak, however, will not be blue. As I don't think it goes with the chaos thing, especially the lighter blue I'm often seeing. Yes, it's probably referencing back to his loyal past (but even then he seemed to be a pretty brutal chap, so would he really pick a nice bright blue cloak... I don't think so). A darker blue may be better, but I'm going to go with black (to start with) on the outside and then a cream/bone colour to the inside. 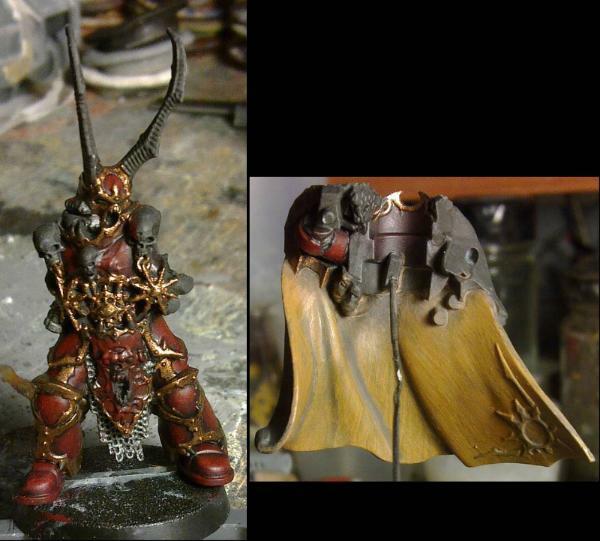 The chaos details on the cloak I'm currently planning on red, possibly a brighter red than the armour. Here's the armour colour as it is, but will get a bit more highlighting once dry. The paint I'm using is a gloss, but he won't be so glossy when I've finished. I like the gloss contrasting the flat, actually. It looks like blood. Thanks Dave. Well maybe I'll gloss it up at the end if it looks like it'll work once I've done all the bling on him (most of those matt surfaces will be metal so there won't be that much matt left). For now though, I've given him a matt coat. Although I think the matt-ness of my current tin of matt varnish is getting as low as the volume, as he's ended up more satin than matt. I'll accept it for now. So the red is done. It's very dark unless you have a bright light on him like in the below photo'. The blending was pretty quick and painless and I hope it actually shows. I have base-coated the metals with my usual brass paint for what will be the light gold parts, and gunmetal for the (few) silvery metal parts. Some may or may not change as I progress (there really is a lot of gold parts...). I've also started on the inside of the cloak. This is only 1/3rd done really, it'll go all the way up to bone eventually. I'm attempting to paint in some texture to the cloth, so if you can see streaks in the paint, those are intentional (for the moment...). and here's the progress on the cloak and how it looks on the model. The cloak will get lighter still on the parts that are more visible. I think it frames the dark armour nicely. And here he is with an arm on. Not glued yet, but can't see any more issues. The sword arm will have to stay off until the end. 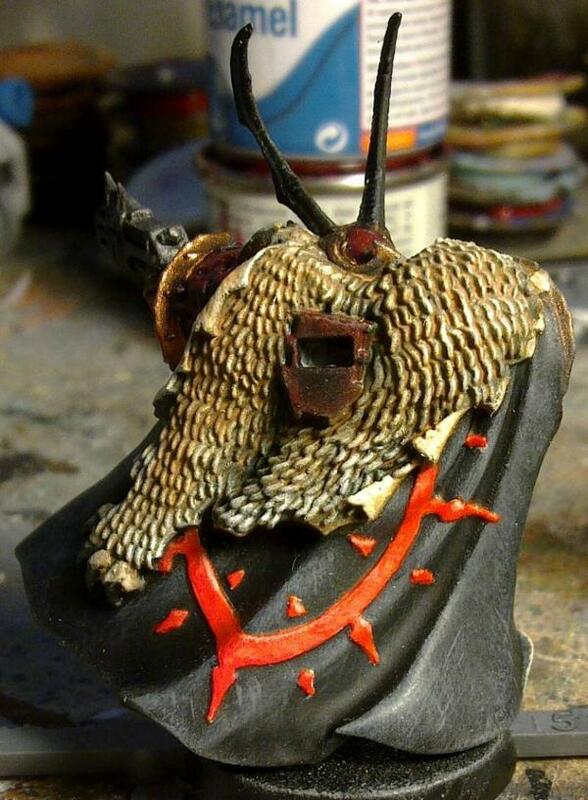 I might do the outside of the cloak with the same technique. Be consistent an' all. Looks brilliant, looks oppulent! Great stuff. Glad you think so, it's tough to get that feeling without using purple (often the colour of the rich and powerful). Next job is...erm... the sword, maybe... need to have that ready for when I do the ghosty bits. I've been back and fourth over the outside of the cloak. I base-coated it black and then attempted to add the thin lines to give it a similar texture to the inside. However, over black the grey lines just showed up far too much and eventually made the cloak look grey and not black. So I washed it over with black and tried again... Then washed that over with black again as it still wasn't looking right. I then settled on giving it a couple of dry-brushes with 2 or 3 greys and then did only a few lines in certain areas. The white will be bright red (a bit like the blood angel in the background, who is nearly finished and will be posted up in my main blog soon), and the fur will be a light (but not as light as the inside) brown. Some sort of leering daemon-thing was my bet, so I pained it (and all the other bits like it) as such, like something trying to enter from the warp or whatever. Nice black. No idea on the thingy. OneManNoodles wrote: Some sort of leering daemon-thing was my bet, so I pained it (and all the other bits like it) as such, like something trying to enter from the warp or whatever. Yeah, what I'm seeing at the moment is a one-eyed thing, with it's mouth full of a large ball (probably another chaos eye). I'll see what I make of it when I come to the ghost/warp painting stage. Thanks. Yeah, I like to try new things and I'm making use of these commission models to do so. Give them that unique touch that hopefully helps them sell (doesn't appear to have hindered their sale anyway). Camkierhi wrote: Nice black. No idea on the thingy. Still have to start on the ghosty bits, but I may do the fur on his back next. That is a beautiful red, looks perfect. There's a bit more variation to the colour than is apparent in the photo, so it's probably a bit too subtle. Mr. The Relentless now has his backpack on. 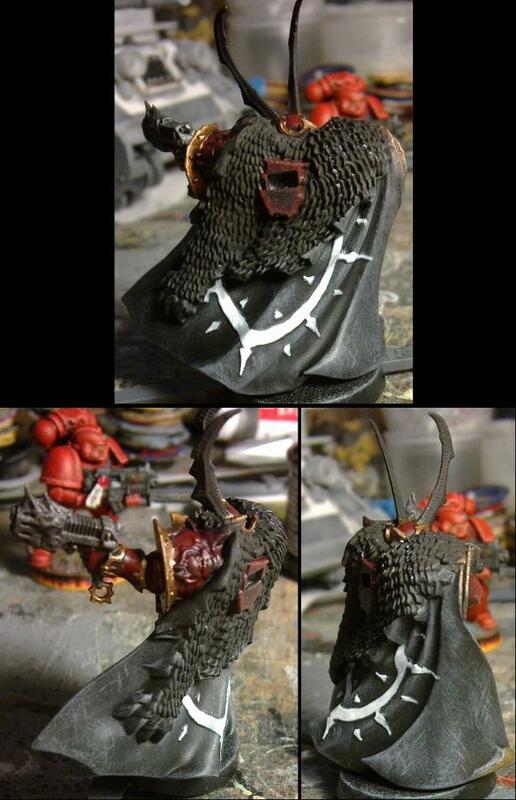 The spine on said backpack and the skulls on his chest have been painted to be bleached bone as the usual "bone" colour would look too similar to the inside of the cloak. The skull exhausts on his backpack have been painted a nice shiny silver/chrome that may make more sense when I do all the shiny gold. Work has started on the sword and depending on how that turns out the ghosty bits will see paint soonish. I will have to do something with the gun before that though. However, I am stuck for what to do with his horns. I'm thinking at the moment that they can be either bone (like the spine, that's grey-scale) or silver (like the backpack skulls). Thanks and thanks, good point. Yeah, bone for the horns. Thanks Monkey. I'll have a look at them in a bit. ...and they're just on the sword. Speaking of which, this is roughly what I was thinking of for the ghosty bits. This was a black basecoat, covered with blue. Then blended/dry-brushed up to white and then washed over with a blue/green and a final highlight of white with a tiny bit of green in. Pretty awesome. I like it. Maybe - and I'm not the one to comment on painting - re-darkening the deeper crevices again, especially those nearer the tip, to regain their depth a bit? Good good. Glad you are liking it. 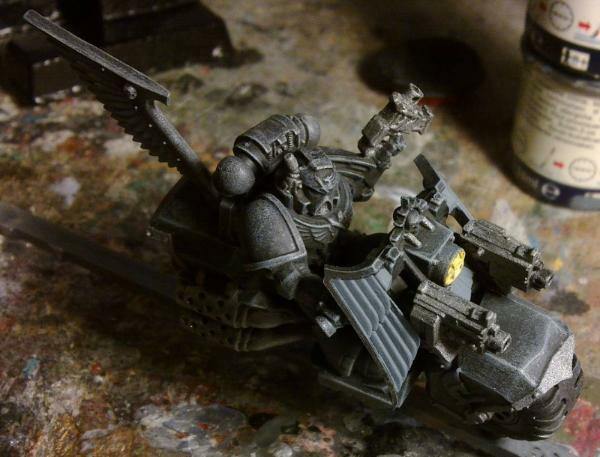 going to be interesting doing this on the armour and gun. Just based the metals on the sword and the tassel will be bright red. The pistol will be mainly grey metal but will get the ghosty bit on top to match the others and the coil may be orange-y and will match the various evil-eyes. Just been watching a bit of Star Wars. Oh yeah, and darkening crevices may happen when I next have a suitable paint out. Ghosty bits done (crevices darkened), red tassel done, metals basecoated... still more to do. Looking good. 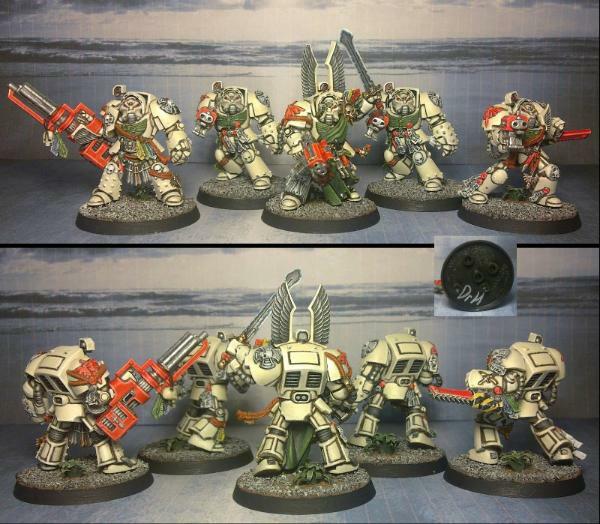 As there seems to be a slight osl look to the ghosts will you be doing something with the plasma coil? 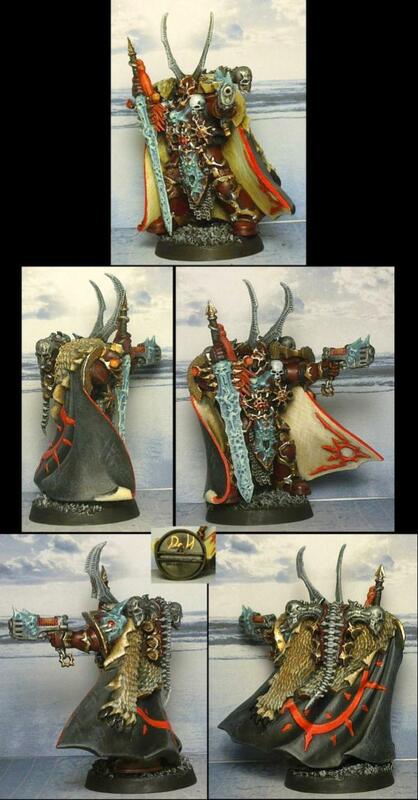 And is it just the light or have you made the reds on the cloak a bit more orange? No, the red's are still red. Probably just the colour balance of the photos (it's tricky to get right and I wasn't looking at the red when I checked the photos). Speaking of orange though, I'm thinking of doing the plasma coil and the evil-eyes in orange. Probably a red-based orange as I'm wary of adding too many colours on him. Looks fabulous, really liking the ghost effect, and the whole thing is falling in nicely. This is turning out to be a real cracker matey. Thanks. Yeah, I'm pleased with how that's turned out. I'm going to have to remember it and do a full ghost member of The Scientist's army (would also need some imaginative fluff too). and the whole thing is falling in nicely. This is turning out to be a real cracker matey. Thanks. It's nice when a model reaches this stage, the list of things to do is shorter than the list of things done, and you can see the finish line (should have him done this week; I have been busy with other things which has slowed progress, honest). ...and make them my Ork tank Busters is that?! Unless someone can see anything I've missed in these quick pictures then I'll finish the base tomorrow and post up decent photos and he'll be up on ebay at some point after that. He's looking great, really like the way you did the fur looks very natural. Truly brilliant, exceptional work, I really like him. Looking very hard for any problems, the only thing I might see, check the edge of the cloak, where the red comes to the cream, a bit about half way down his left, looks maybe like the red is over a bit far, not absolutely straight. Tiny touch on that of the cream and I think it is the masterpiece I thought it would be. I am being silly mind you. You really are pushing the limits of brilliance and especially with paints of a completely different breed. I think you may have missed the stacks of pancakes in the background...at least one of them appears to have gone green....never a good sign with flour-based treats. 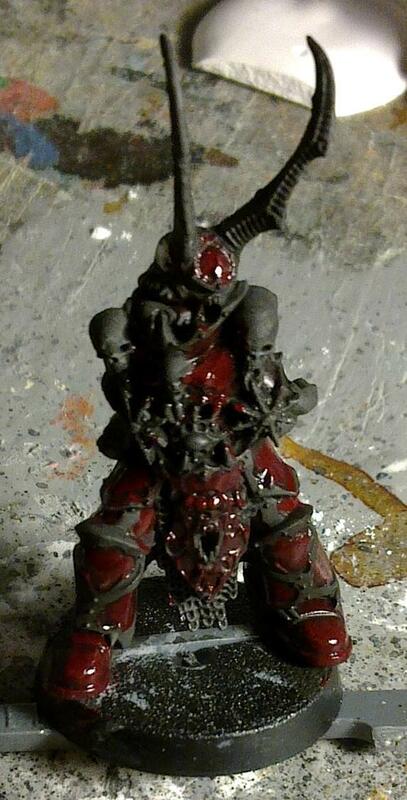 Loving the cool contrast on the daemon-y bits to the rest of the armour. Can't see anything glaringly obvious. Wow. 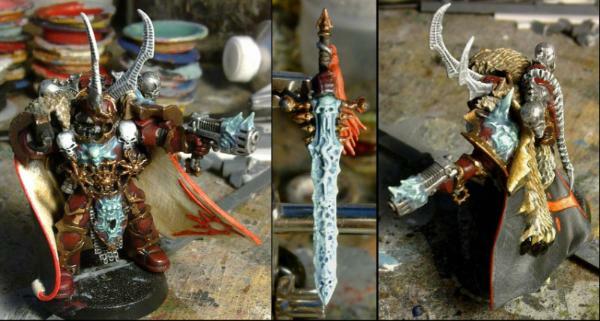 I love that paintjob especially the sword and how the colors really work to give it that ghostly look. I've tried to do the same before and can never seem to get the colors and blending right, very impressive. Camkierhi wrote: Truly brilliant, exceptional work, I really like him. I'm flattered you think so. Just goes to show that using Enamel paints are not an excuse for a poor paint-job. monkeytroll wrote: I think you may have missed the stacks of pancakes in the background...at least one of them appears to have gone green....never a good sign with flour-based treats. Incidentally that green one (as opposed to any of the other possible green ones) is the colour of the wash I used on the ghosty bits. I'm quite pleased at how the various contrasts have worked out. Can't say whether it was through luck or judgement though. Ir0njack wrote: Wow. 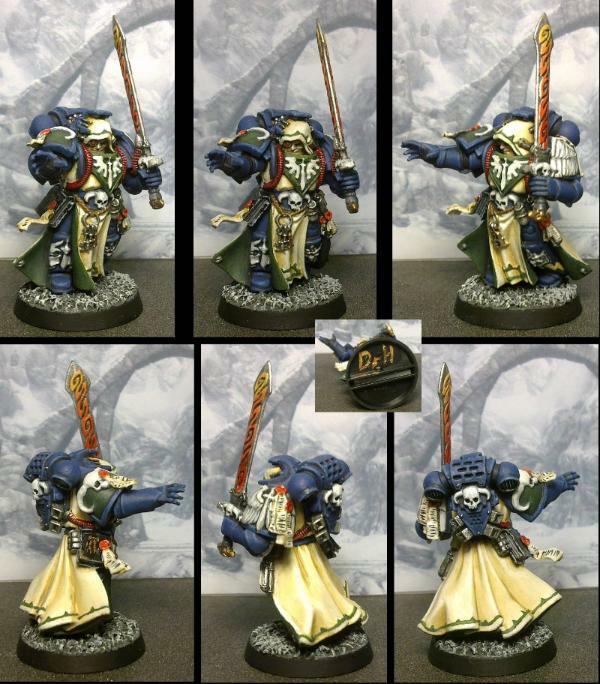 I love that paintjob especially the sword and how the colors really work to give it that ghostly look. I've tried to do the same before and can never seem to get the colors and blending right, very impressive. Thanks Jack. Glad you like it. I spent a fair amount of time researching the right colour for ghosts and then looked at what colours were used. Except for the occasional monotone green one, I found that the most pleasing ones had a blue tint to the shadows and were highlighted with white. So, I painted the shading in blue (3 layers of dry-brushing) with a highlight of white. Then washed over everything with a blue-green that I mixed by eye. A final highlight with white (with a tiny touch of green) and then used a dilute wash of blue (the original base colour) applied to some of the recesses to darken them if they needed it. The few little touch ups are done and here's the final pictures. He'll be up on ebay soon-ish and I'll post the link here. Yup, just as I thought *bleep* amazing. Fantastic job matey. I so should have done. But it wasn't that long ago I last watched it anyway. I did think about giving the edges a dry-brush of silver to do that, but the effect was so nice I decided that I didn't want to disturb it and so, ghost-sword it is. I forgot the put the link up in here. Kranon the One That Does Not Relent is up on ebay and has been for a little while. Still working on my tank (in my main thread), but keep your eyes peeled for when I start the next bunch of cultists. £35?! That's a bargain, I would say! Can't stop staring at the back view, so clean!!! Thanks Squidbot. Glad you think so. lid for a launder hamper? is it a pedestal sink? Needs to have a deeper back for the taps to sit on. White part's a giant scatter pillow, the grey part's a pouffe? Theophony wrote: lid for a launder hamper? I can see where the monitors come from. The backs will be extended, see below. monkeytroll wrote: White part's a giant scatter pillow, the grey part's a pouffe? The grey part is actually not-so-blu tack. Due to my previous experience with the toilets and seeing Cam and his bath, I decided to use a former to make the shell of the sink around it. 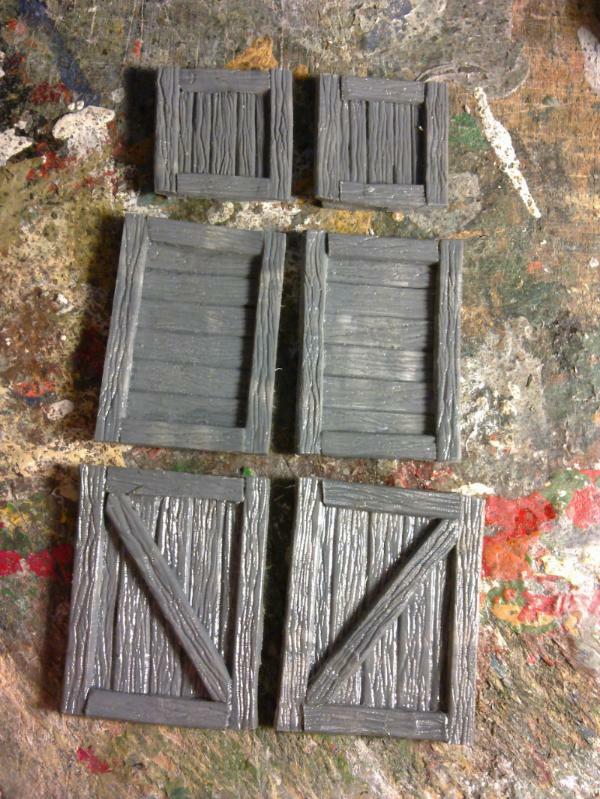 These are to match the Tainted toilets in my "of course they are not Fallout models" range. 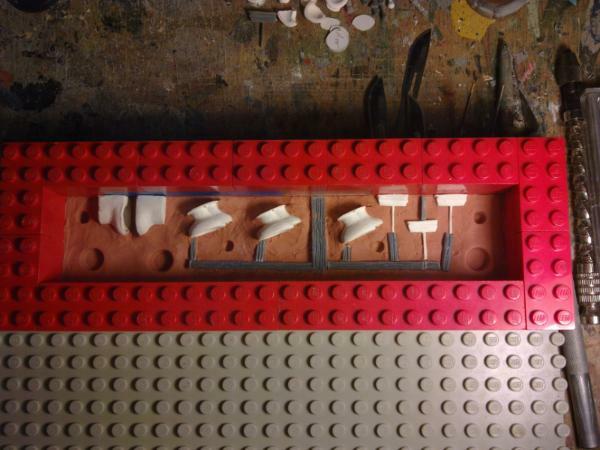 The backs will be built up (as below) and the insides need some putty to give the proper shape. I'm doing two so that I can try different things with them and hopefully end up with at least one good sculpt. Here's the progress on the back of the sinks and a picture of what they are aimed at. A lot more work is needed. Needs the lip and the whole shape has to be rounded. I might, like with the toilets, make a "normal" looking sink. Once I get the right technique. The taps are going to be the difficult thing to produce. I have a plan, but will have to see. A little progress on the sinks. I added some putty inside the bowls to give that shape and I added a lip around one of them (with the left over putty from the insides). I then gave that sink a good sanding to try are get the shape. 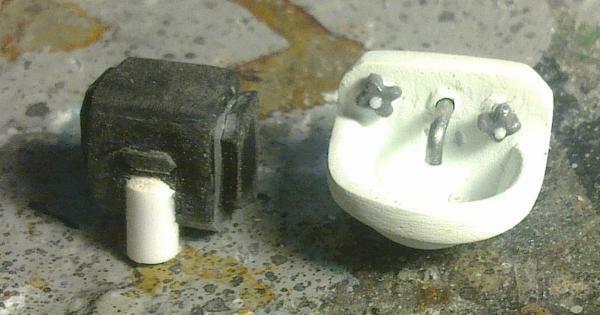 Here's a comparison shot with a Tainted toilet and SM #9. While the shape is ok, I think the basin is a little too large (compared to the toilet) and this makes the pedestal look too thin. I don't have a good picture that shows both sink and toilet, so I'm going to have to have a wander about and find one. That didn't take long. 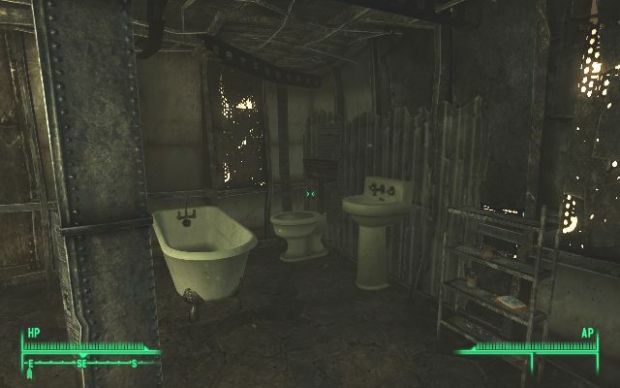 I found the perfect bathroom in Novac and now have many reference pictures. What they show, however, is that my drawings that I made from previous reference pictures weren't right. I made the basin too square, it should be rounder on the front. The whole sink needs to be about as high as the cistern. ...and the basin just slightly too large. I may still carry one of these on as a variant, but will make some new ones from scratch. So this is the progress on the all new sinks. Better size, shape and... just better really. I made the basin first. With an open back so that I could sand the inside easier. and I've just now done the rear part of these. Once that sets I can set about it with more sanding and then see how they fit with the new, thicker, pedestals. Then, details. The pedestal did look a little thin there, but the basin doesn't seem too large to me. Yeah, the thickness was based on calculations of the scale on a drawing. The same kind of calculations were off when I did the toilets too. It helps to give an idea of what you are building, but you have to make them to see how they measure up. Good thing too, as the new basins are currently slightly larger... blame the addition of the lip. They will be sanded down a bit. A mm here of there is not the end of the world, so long as they look right. Yeah, it's a pain in the backside to try and get a smooth finish inside a hole/dip that is smaller than your finger. Had the same issue with the toilets. I'll tidy up that unevenness on the back of that one, sand down the other one, shorten the pedestals and then look at adding the details. And I've started adding details to the basins and pedestals. Locations for the taps and spout, the overflow and the water connections at the back. I keep making a mess of the overflow on the second sink and having to re-fill it. Next job will be to make some quick putty casts of these with the wonder material that is Oyumaru. 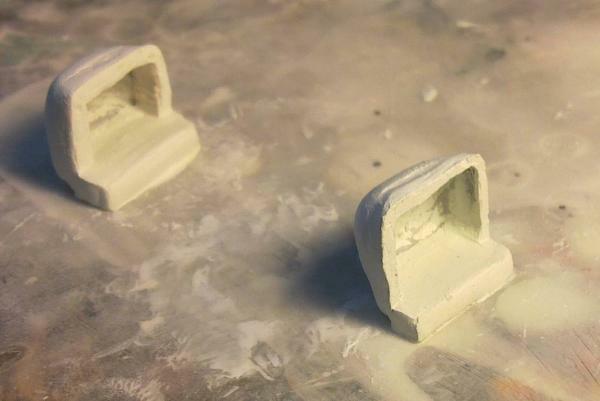 Then I can fine tune the shape and detail before they can be moulded and cast proper. 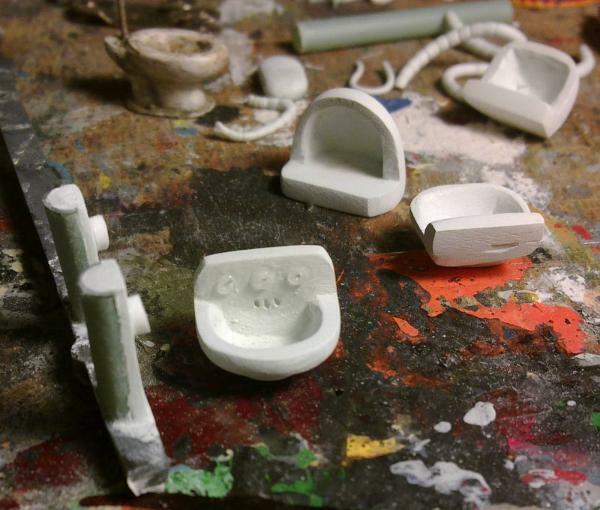 Yeah, the putty casts may be sanded down a little more. Remember that these won't be standing on a piece of sprue when in place, so will look much shorter next to a model standing on a base. Look pretty special matey. Excellent work. Sinky sink of sinking feelings of sinkness. Camkierhi wrote: Look pretty special matey. Excellent work. cormadepanda wrote: Sinky sink of sinking feelings of sinkness. More Sink in Progress for you. Well, a little progress. I've been making copies of the better basin and the pedestals using the amazing stuff that is Oyumaru (I love this stuff). They are not the best of casts, but they will be touched up and sanded down and I will hopefully get a couple of good casting masters out of them which I will then make a silicone mould from. There's also something else I want to make before I get around to the moulding and casting stage though. Well, this update pleases me. Instant mold is awesome. good stuff! 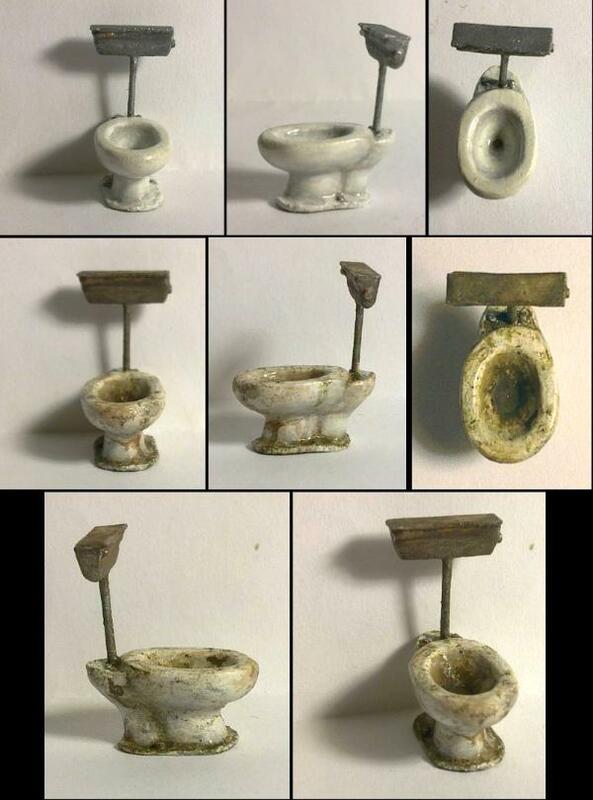 I'd love to get my hands on a few, I have a few ideas for them and the toilets. Looks like polymorph, http://www.rapidonline.com/design-technology/polymorph-polymer-34444 Really useful stuff, a mate of mine gave me a pile. I take it it's a thermoplastic like that? cormadepanda wrote: Well, this update pleases me. Instant mold is awesome. OneManNoodles wrote: good stuff! I'd love to get my hands on a few, I have a few ideas for them and the toilets. 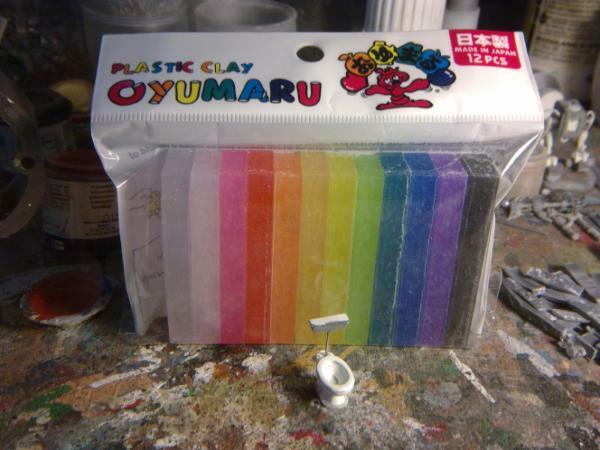 Oyumaru is the Chinese version of Instant mold. Thanks. 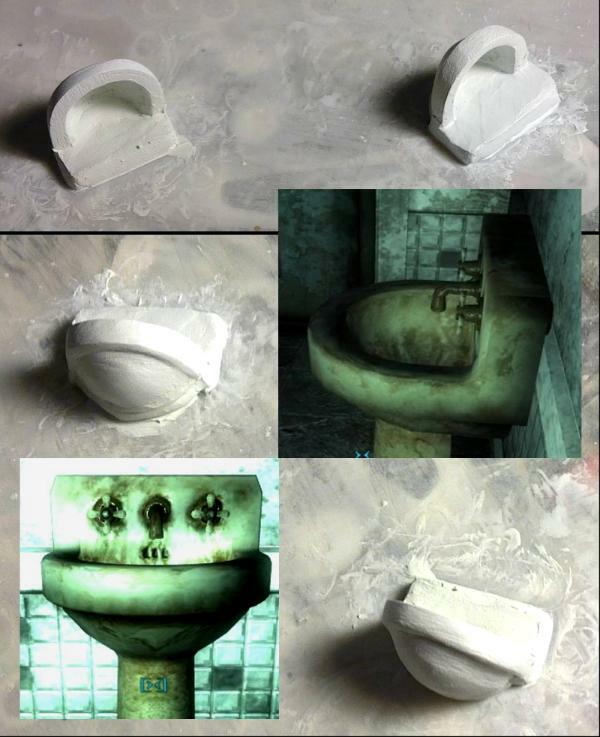 Well the sinks in-game have a pipe connection out the back of the pedestal, so it must be added. I've had a few problems getting a good cast of the sinks, but I now have that pretty much sorted. I also remembered to add location details on the bottom of the basin and top of the pedestal, so that the position is obvious. Still more work to be done on these to tidy them up, but here's the progress so far. 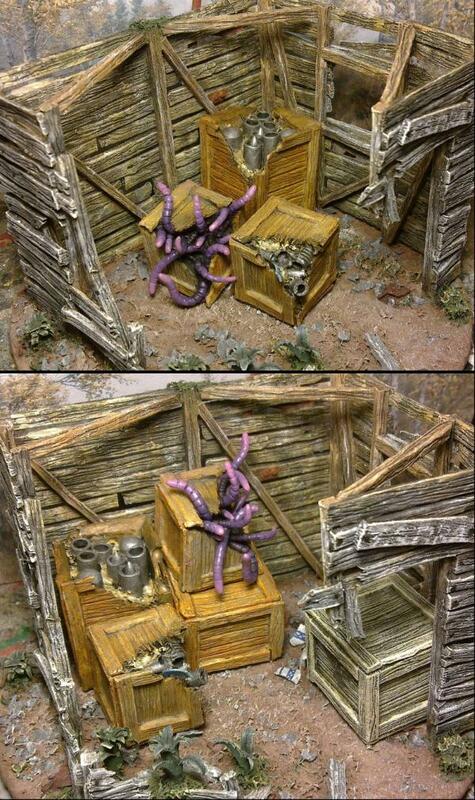 ...so I totally read 'sinks', thought you meant 'skinks' like the Lizardmen, and found actual miniature sinks. What will people come up with next? I have a long list of things to make, it's just a matter of time before I get around to it. Oyumaru - awesome stuff and half the price of Instamold! I too, was distracted by your dozer blade work - very clever construction. Fantastic!! I can't wait to be your first customer! Because of humans, and hygiene being important to our survival. And rads. Where else do you wash your hands after using the Dr's toilets? Ofcourse you need sinks. It is what all those ruins have been missing for all these years. Broken down old buildings always have the bathroom exposed. Sinks look fantastic, I will definately be ordering up some of these. ^^^Wash?... Hands? ... What is this odd notion? Have to admit, pretty cool. If you can do stuff like that to scale, people who do other sorts of modelling (dollhouses, larger scale railroad, etc) may be interested too. This hobby of ours encompasses a pretty small group. Cast a wider net for more fish, er potential customers. Not just for 40k though. They are just at that scale. That's why I got it and not Instantmold. dsteingass wrote: Fantastic!! I can't wait to be your first customer! Partly the below, and that when I started out with making things to sell, I asked what people wanted to buy. The first answers I got were for boxes/crates and toilets (specifically those to match Fallout). Once I'd made the toilets, I had to continue to complete the bathroom items and produce a complete set. 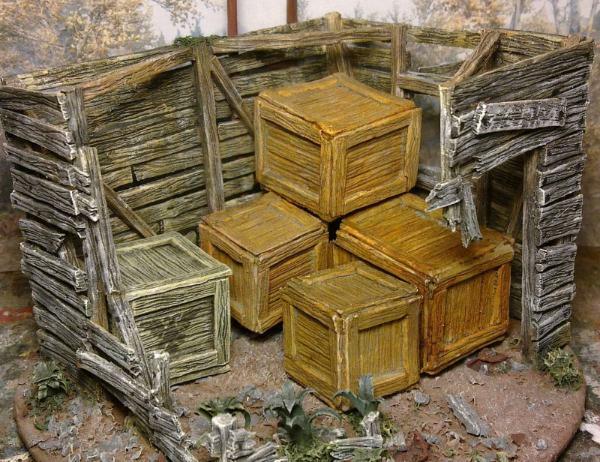 These and the other things I sell (currently boxes) and plan to make and sell are all to add that extra level of detail to terrain features or model bases. 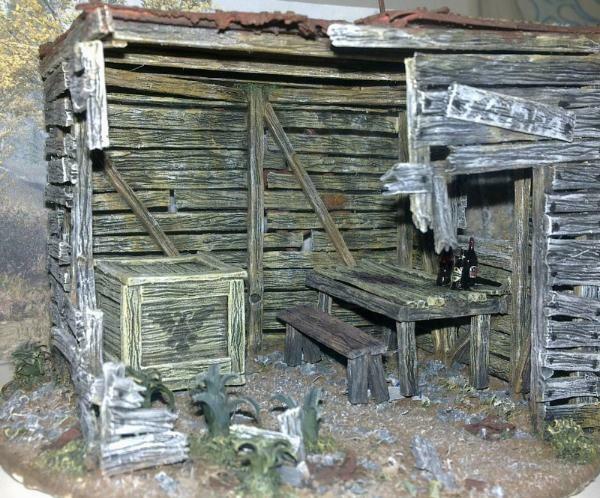 You could represent a ruin with two walls with a few cracks in, or you could make a ruin as you would find in reality with old/unused/broken tables, chairs, toilets, sinks and baths... These things don't disappear just because the building got hit with a shell. Little details make all the difference in modelling. dsteingass wrote: Because of humans, and hygiene being important to our survival. And rads. Camkierhi wrote: Where else do you wash your hands after using the Dr's toilets? Ofcourse you need sinks. It is what all those ruins have been missing for all these years. Broken down old buildings always have the bathroom exposed. Thanks Cam. Good to hear. Red Harvest wrote: ^^^Wash?... Hands? ... What is this odd notion? Sinks look almost finished, so put me down for your second customer and thanks for the oyumaru tip. I've had a look at making the fittings for the sinks. Part way through the carving of the sprue spout I remembered that wire would be easier to use in scale. The paperclip appears to be the best as it's slightly thicker than the copper wire I have. I will add a thicker end to the spout with some putty to give it a proper spout look. The taps are still a wip here. I will make quite a few and then pick the best of the ones that don't break (I had one break today). These are cut from a half-thickness piece of sprue and then sanded smooth and round and thinner. They will be then mounted on a short length of wire to make the final pieces. Good luck casting those, I was just thinking about making my own. They are not far off. The fittings need to be done first and I have something else I want to make first before moulding and casting (as the resin needs to be used once it's open). I will let you all know when they are ready. The detail that Oyumaru picks up is great. You do have to make sure you get it into all the corners to get a good mould. It's silicone as well, so things like GS and milliput don't stick to it. 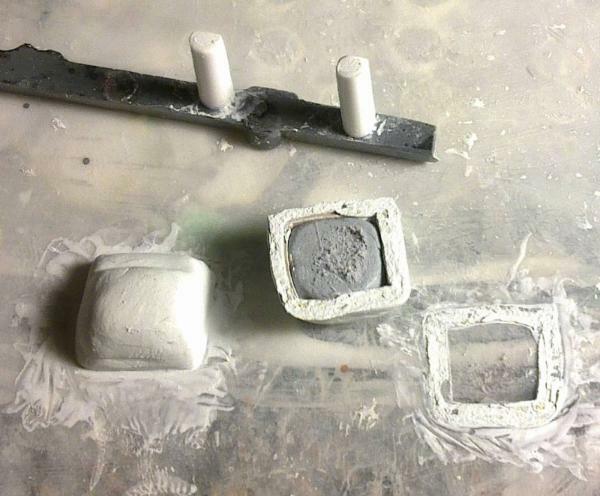 It's reusable and you can chop it up to make 2-part moulds and then stick it back together to make larger moulds. So far, after many uses, the bits I've been using (there are some in that pack that I haven't touched yet) still work as well as the first time. You can't use it for resin casting really, as the heat of the curing will likely soften the Oyumaru and you loose the detail in the mould. OneManNoodles wrote: Good luck casting those, I was just thinking about making my own. Yeah, they are going to be the main challenge. I think it's possible though. At first I thought "what the hell?" but now that I see what you're doing, I think it's great on so many levels. How much are you going to be selling the sink and toilet combos for? I seem to get that often with my modelling. Thanks. It depends on how much resin is required per sink (which I won't know until I've done the moulds), but they should be similar to the toilets. 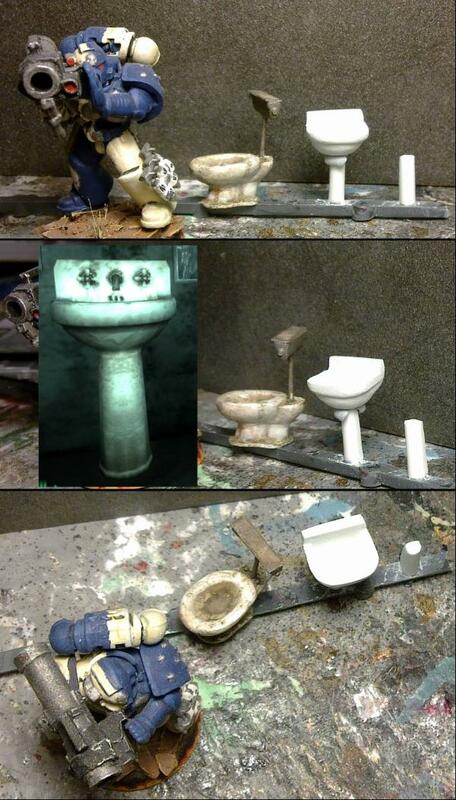 The Tainted toilets (the ones based on Fallout) are currently going for £0.80 each, or £2 for 3 (as they are cast on a sprue of 3, makes life easier for everyone). So if the sinks use about the same amount of resin and end up at 80p each, then I may do a sink and toilet together for £1.50... They may use less and therefore it'll be less overall. I'm also planning a sprue of 3 for the sinks and so some offer for 3 of each may also happen. I've found a better way to make the taps. Rather than cut a square and then cut the shape out of that, I've been cutting grooves into the sides of a piece of sprue, rounding the exposed edges and then cutting the tap off. A little more sanding and then drill a central hole and you have much more standardised taps. They still need a little more work, but I should be able to get a good pair out of those. Good job, works for me. The taps needed a fair amount of sanding down to get them in scale (and so they didn't catch on the edge of the sink...) and I've now added the rod for them. 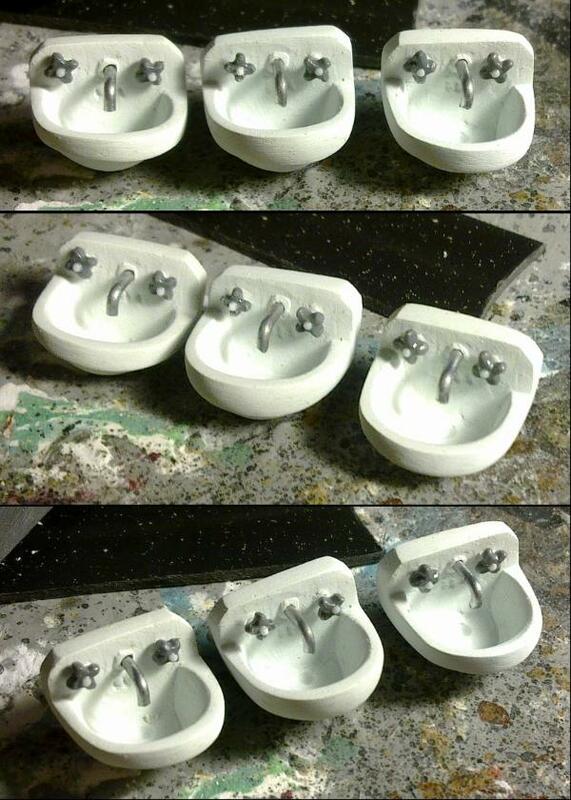 I also made a full set of 6 and I've made the spouts for all 3 sinks. However, putting these 3 sinks together (without glue) has left me with a question. Should I have the taps separate, or have them moulded on to the basin? To give an idea of scale, the white rod that is through the centre of the taps is 0.5mm (0.02") and sticks out the back of the tap by about 1mm. They are very tiny pieces. Or easy, not all that different looking, moulded on taps... ? Will they cast with the taps in situ? Won't that create undercuts? They will have to be flat on the surface and not stick out like they can if I do them separate. That's the trade-off. Well if they cast well, i may need a few sinks. Thanks Comrade. Everybody needs a few sinks. Can anyone tell what it is though?